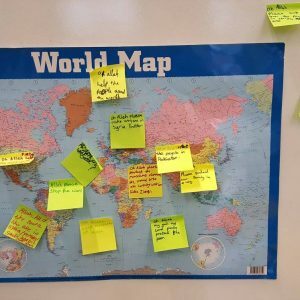 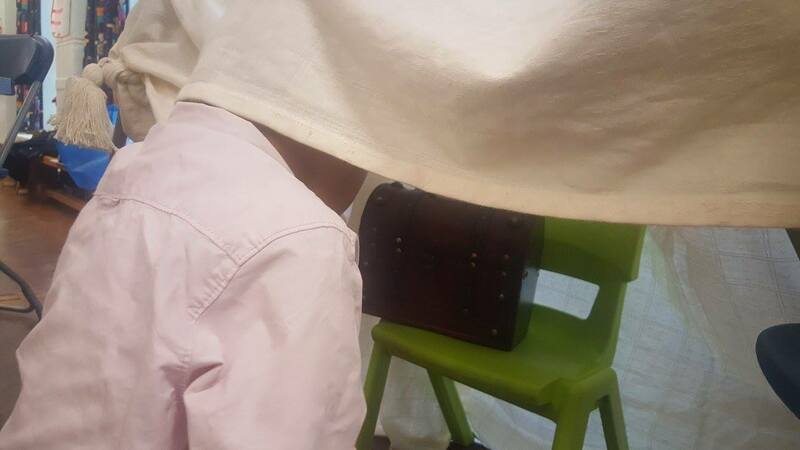 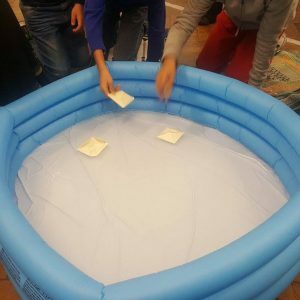 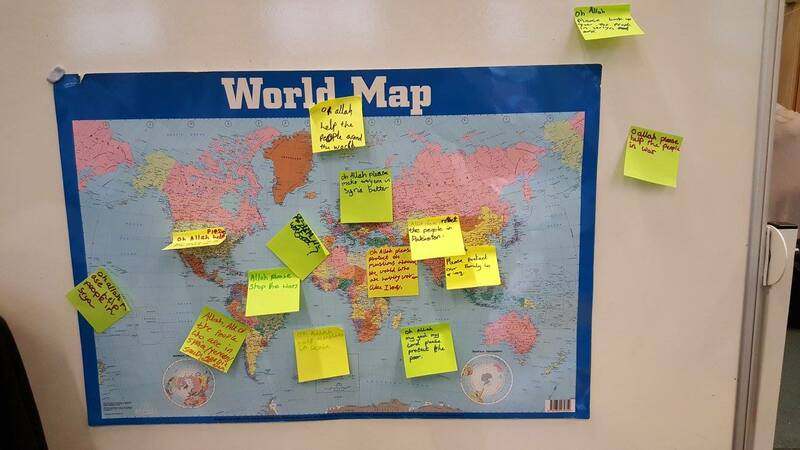 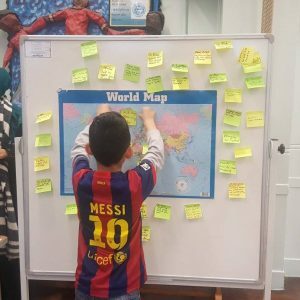 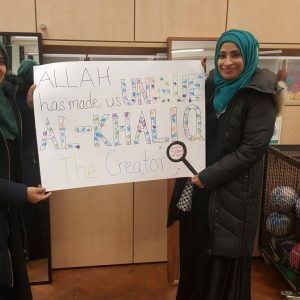 You are here: Home » Posts tagged "school"
Alhamdulillah, following on from the success of last year’s Hajj Activity Day, we had the opportunity to go in to our children’s school again – this time to share the month of Ramadan with them! 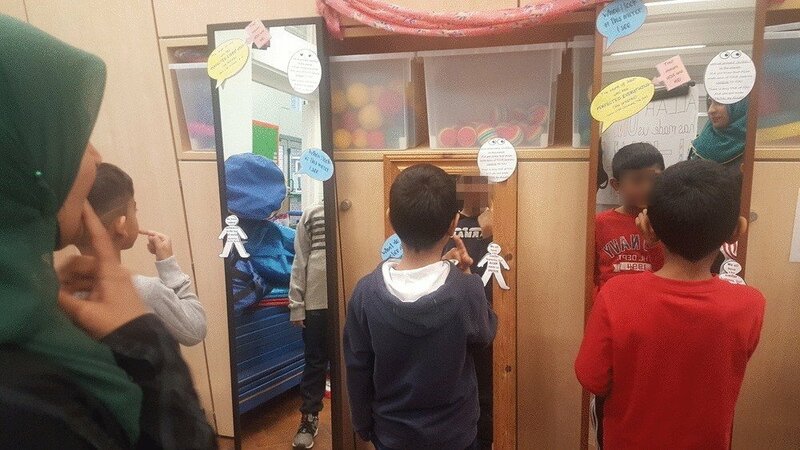 Each class came into the hall and we had about 35 minutes with them. 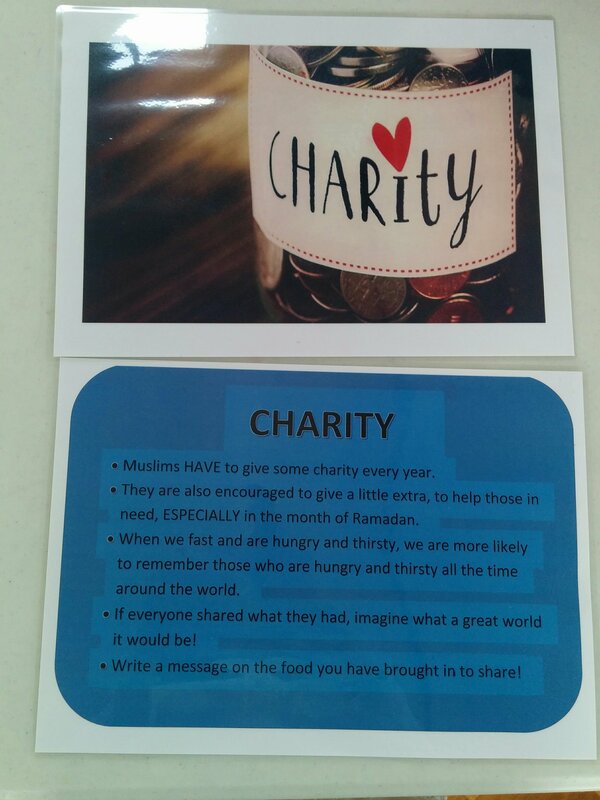 After a quick introduction to how Muslims greet each other, we introduced the notion of the month of Ramadan being an Islamic month (it’s not one of the 12 months they know about) and that it’s a month of fasting. 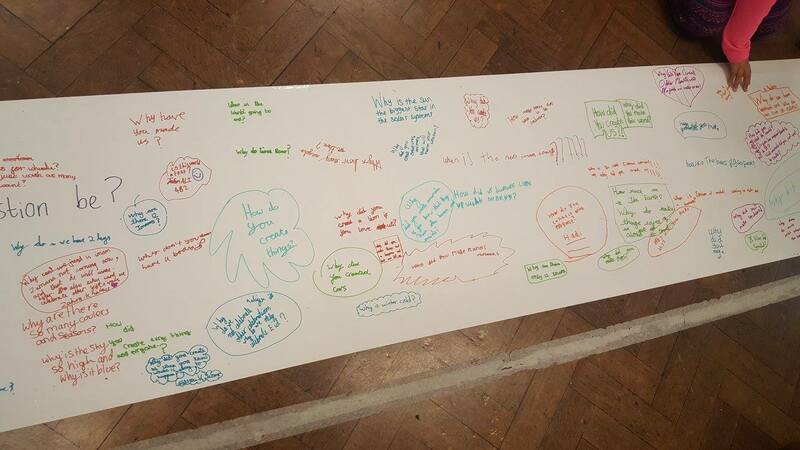 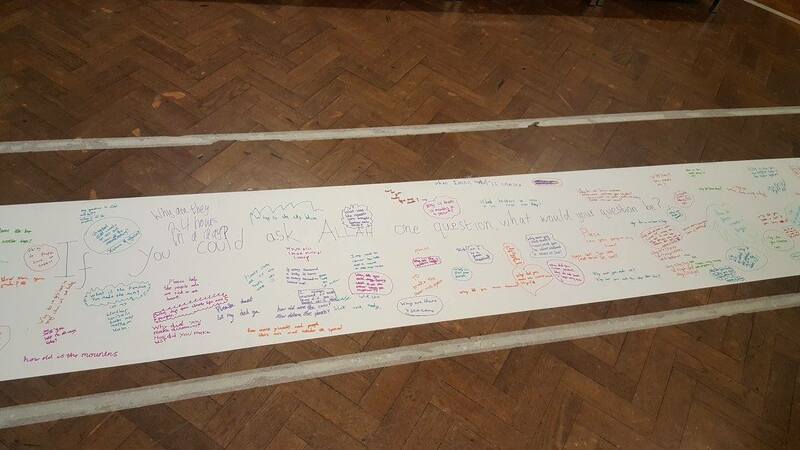 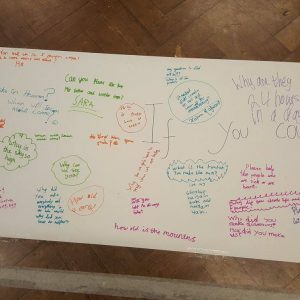 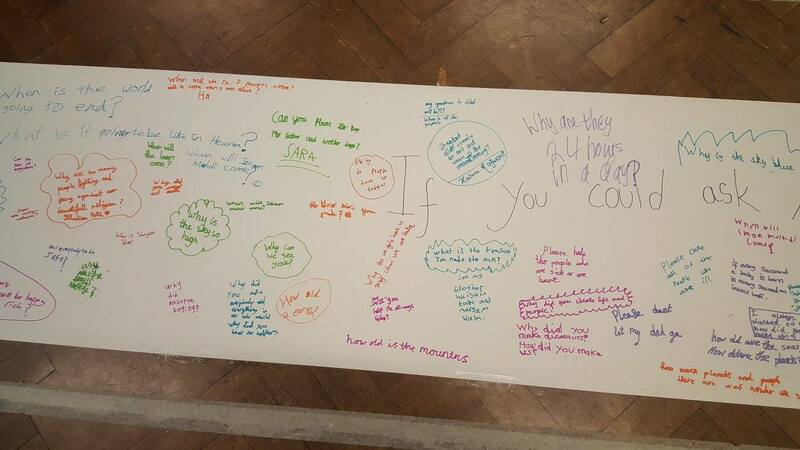 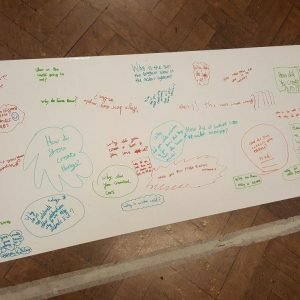 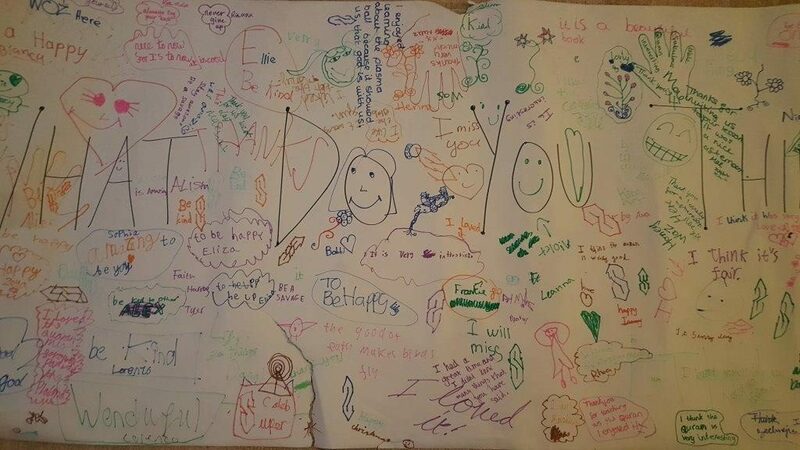 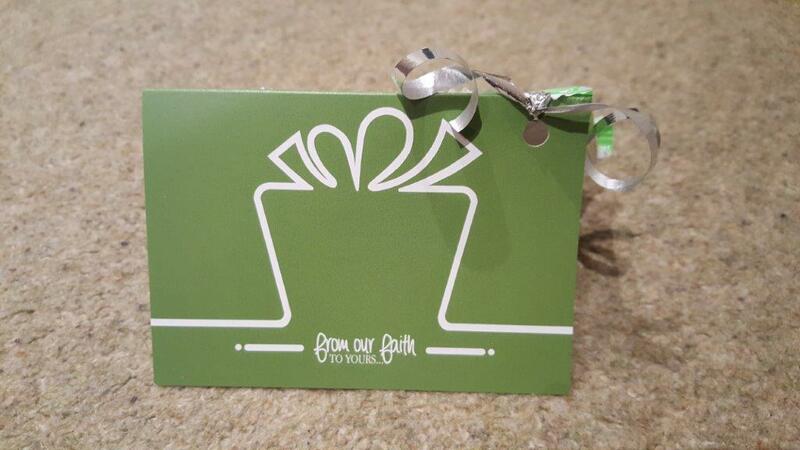 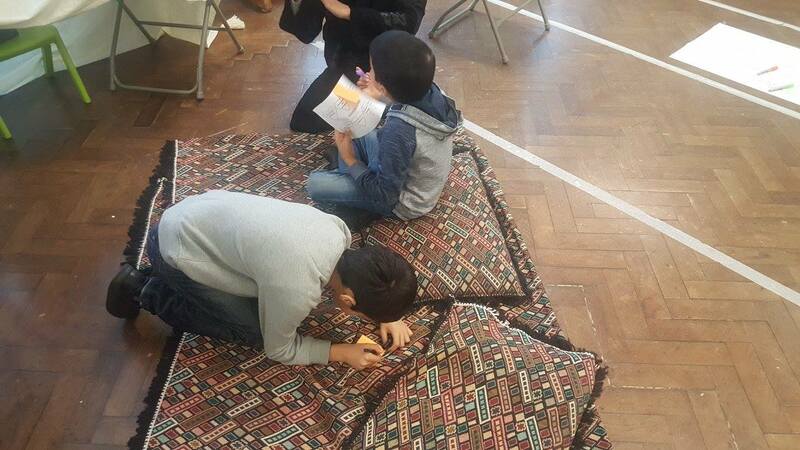 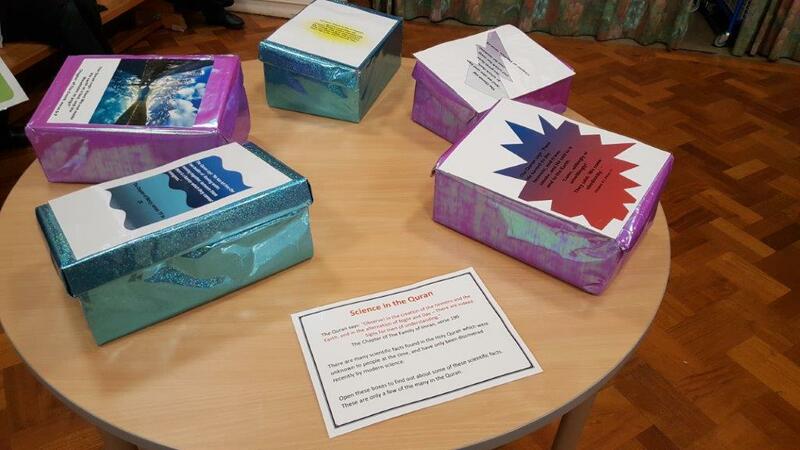 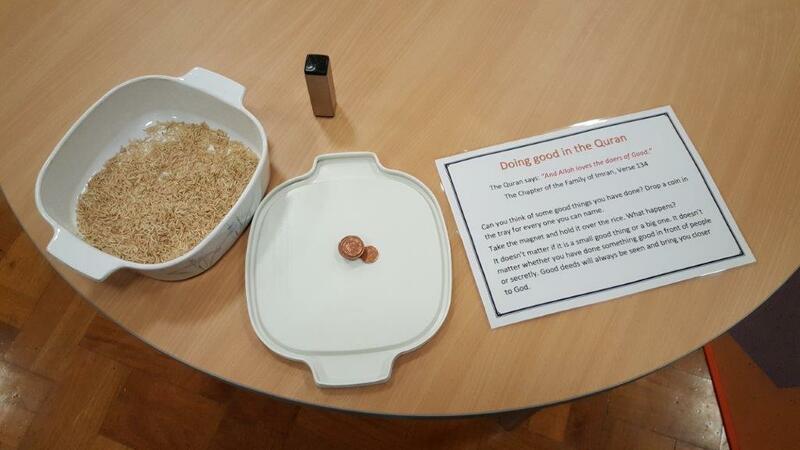 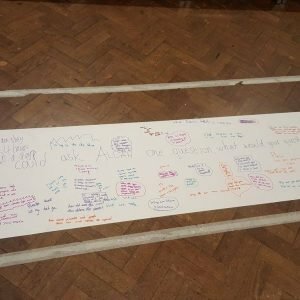 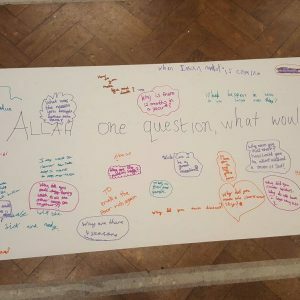 The children were asked if they knew other religions that fasted (yes, they do! 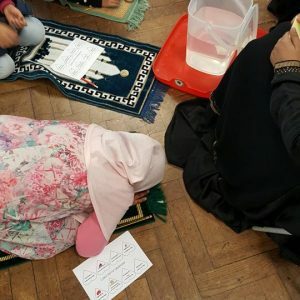 ), and were told that they would be learning all about how Muslims fast. 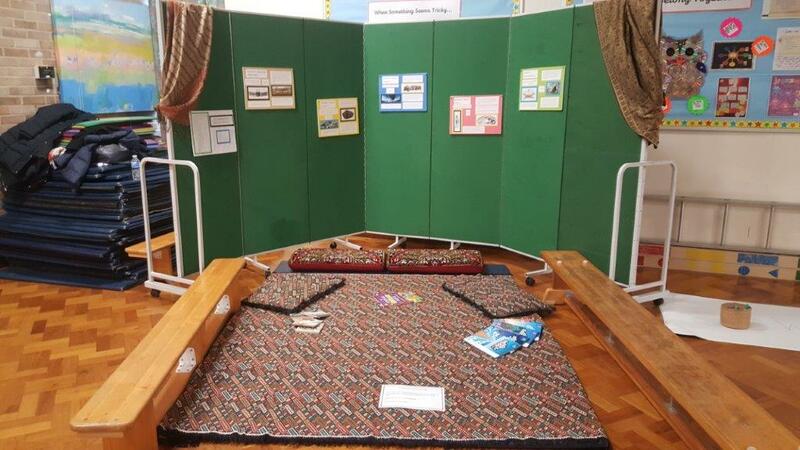 The children were divided into groups of five/six and went off to different stations around the hall! 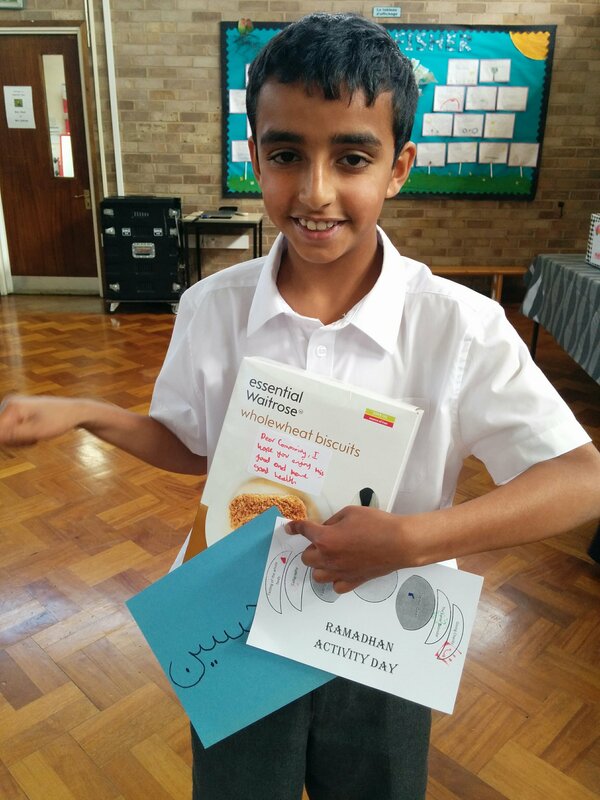 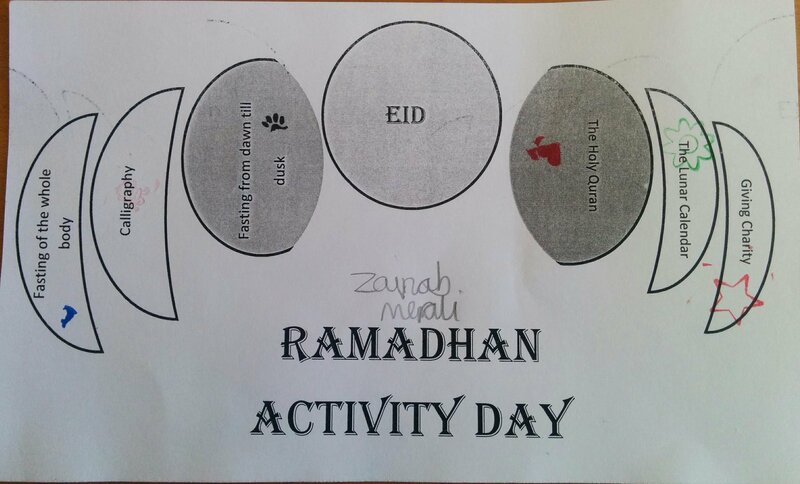 Each one got their Ramadan Activity Day station card represented by the different stages of the moon. 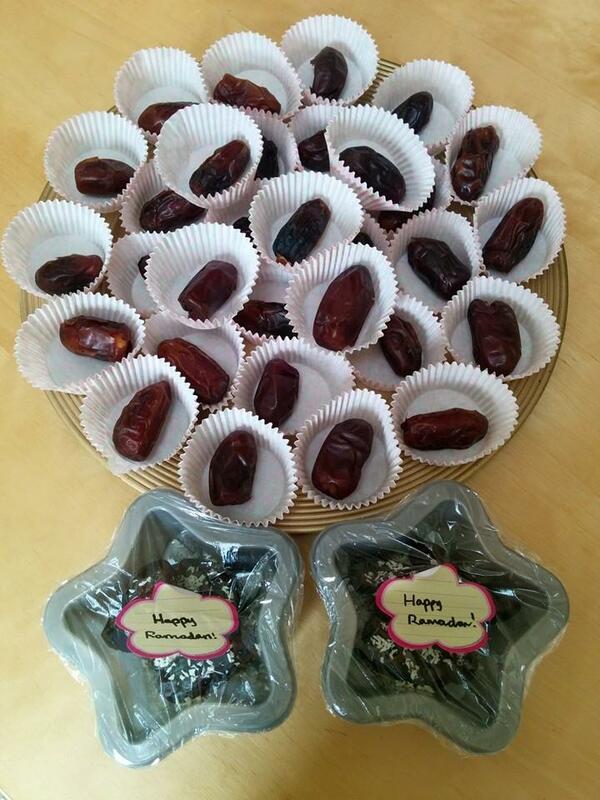 Once all stations were stamped, the month would be over and it would be time for Eid! 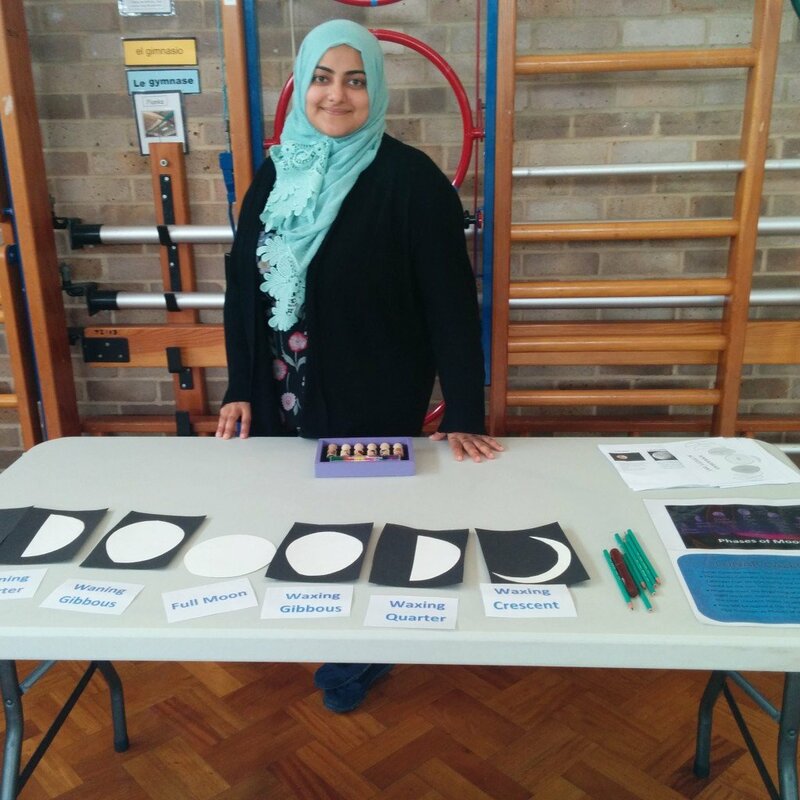 Here the children were first introduced to a calendar which follows the moon rather than the sun, and therefore how it changes over the years. 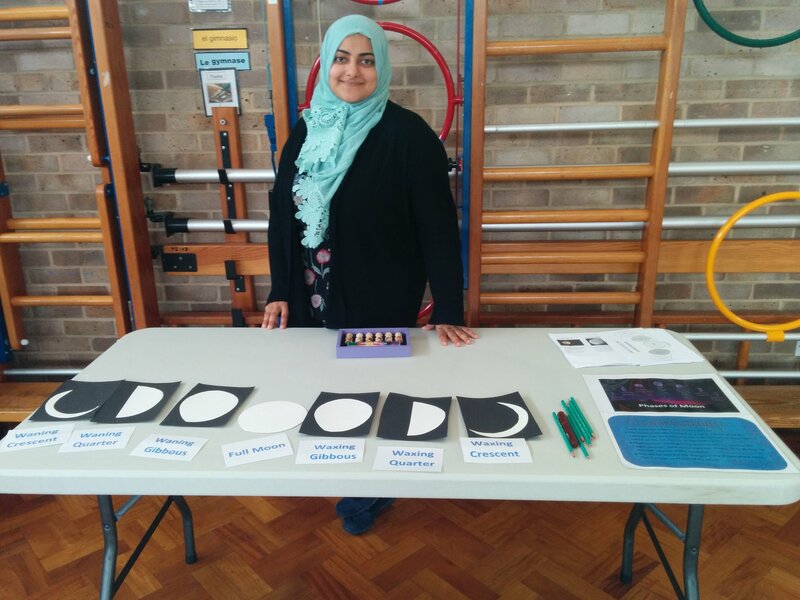 They were introduced to the fact that some other religions also follow the lunar calendar, and then as a group, they went through the moon phases, and then were given the task of arranging pre-cut moon phase shapes into order. 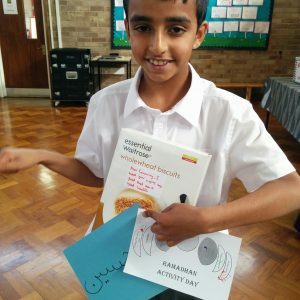 An added challenge for Key Stage 2 (but many from Key Stage 1 were also able!) 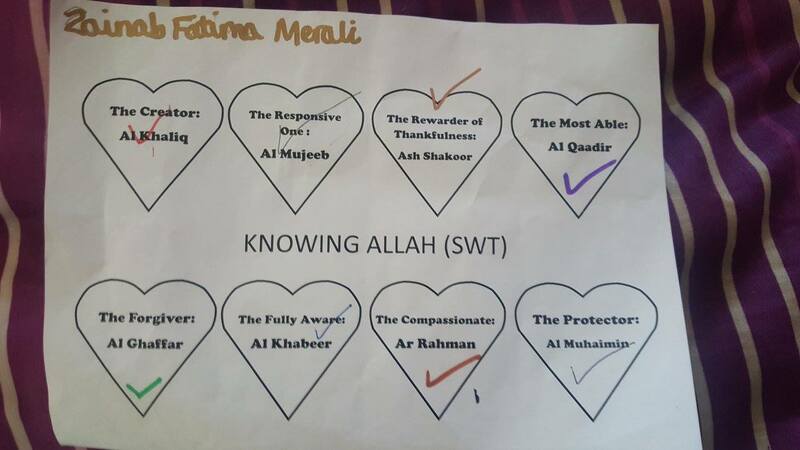 was to label the phases too! 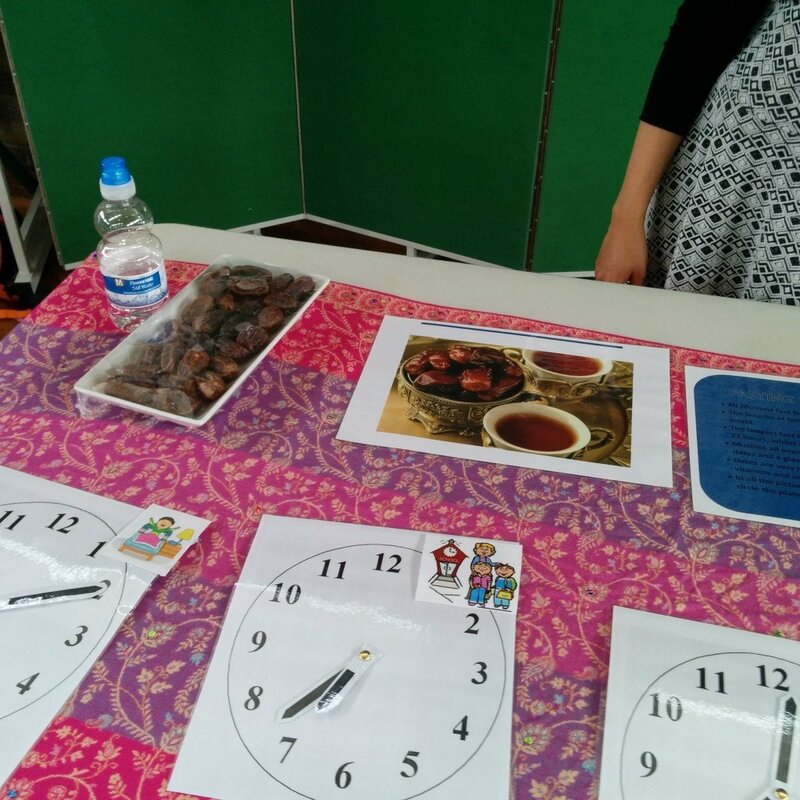 Here the children learnt about the timings of the fast, and that no, we don’t starve for 30 days on the trot! 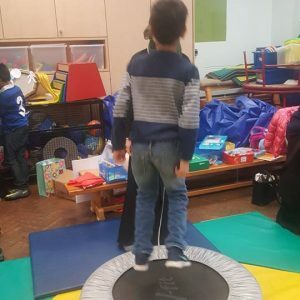 The younger began by discussing the times they woke up, went to school, went to bed, etc – and were encouraged to stick relevant pictures on to the clock faces and try to set the clocks themselves if they were able. 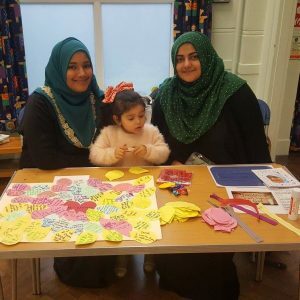 They then discussed how Muslims don’t eat from sunrise to sunset, and older children were shown how this varies across the globe, and across different years. 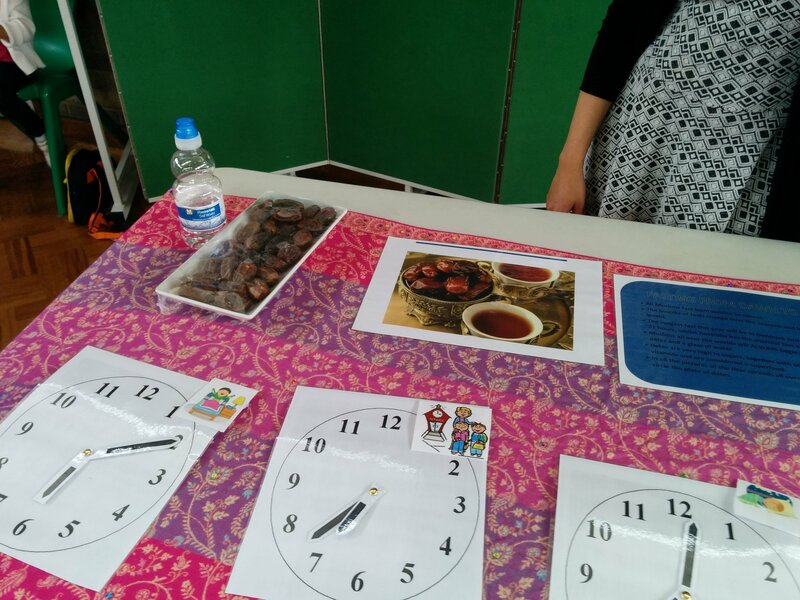 They had a fact sheet to look at about the different hours of fasting around the world! 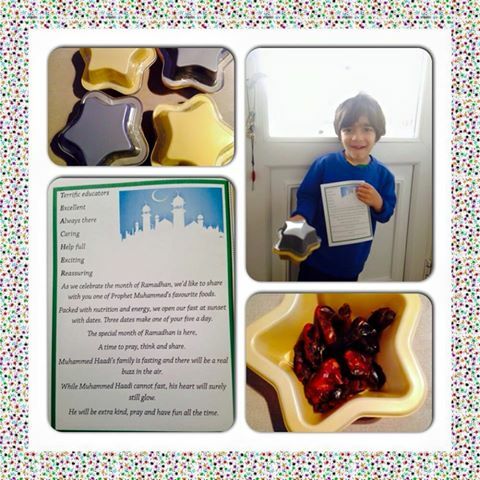 At dusk, we break our fast with dates – the children were shown a plate of dates and explained how this was a constant, and why it was recommended. 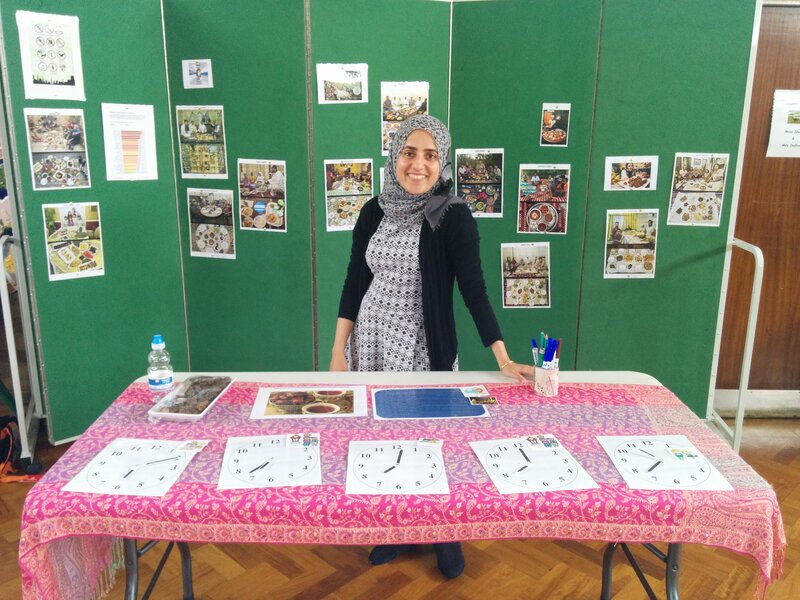 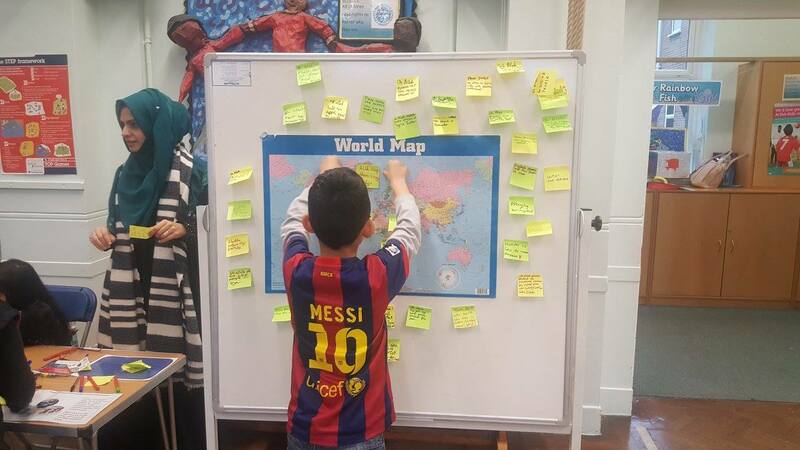 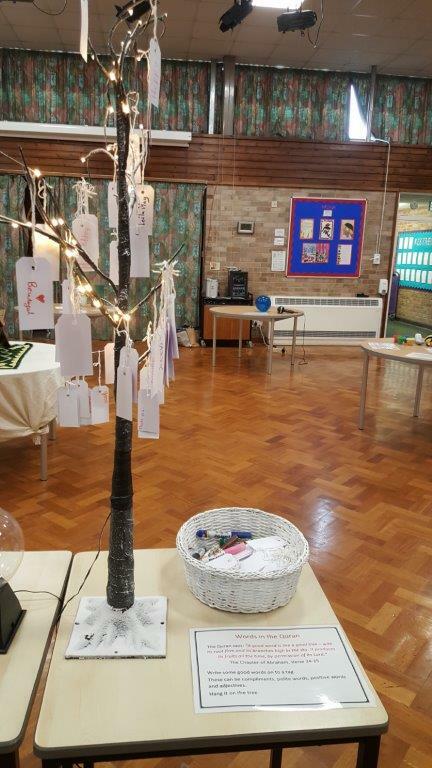 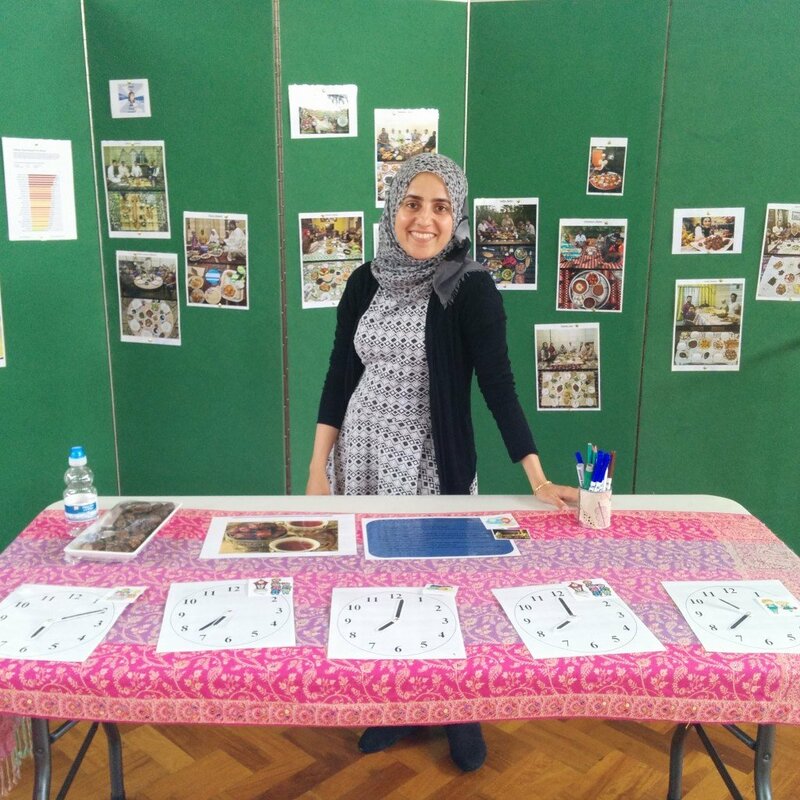 This station had an amazing display of pictures of people in different countries breaking their fast with different spreads – the children then had to go around the spot the dates and circle it in each different picture! 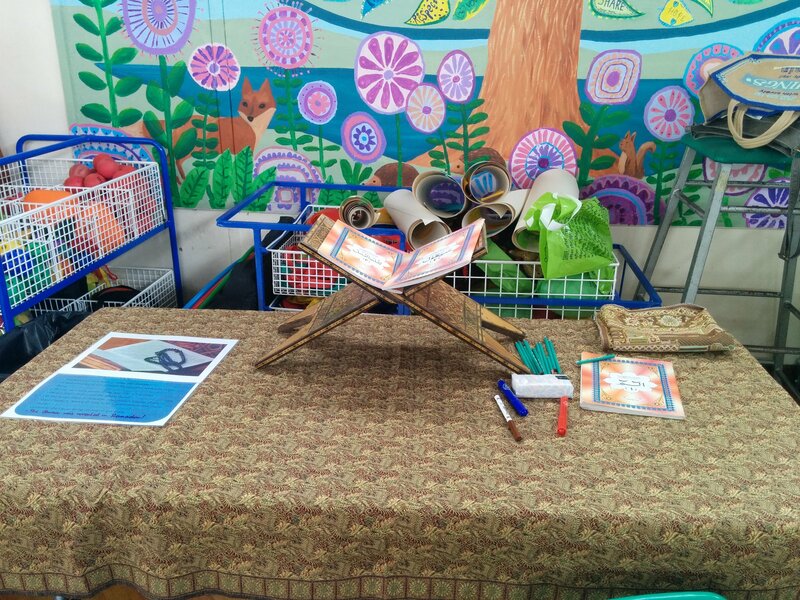 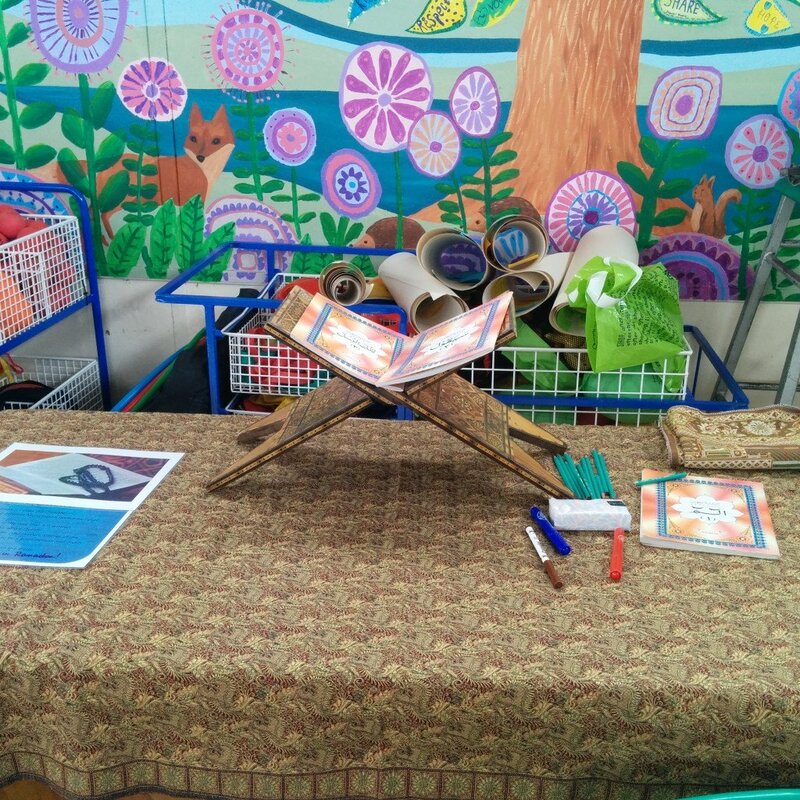 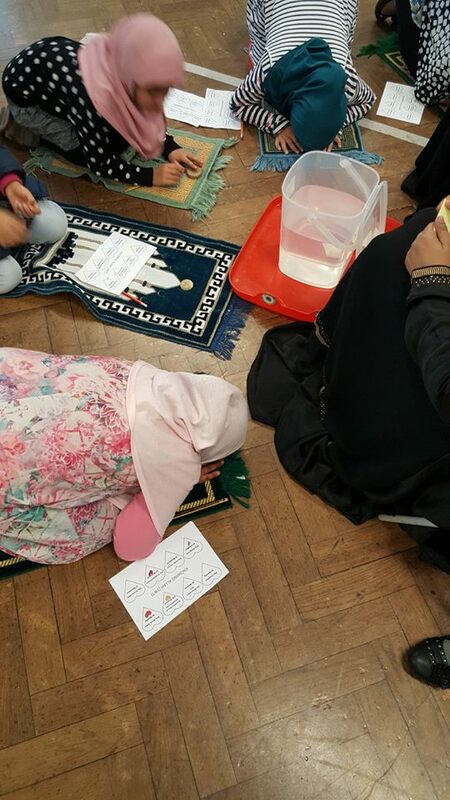 At this station, the children learnt that one of the reasons Ramadan is so special is because the Holy Quran was revealed in it! 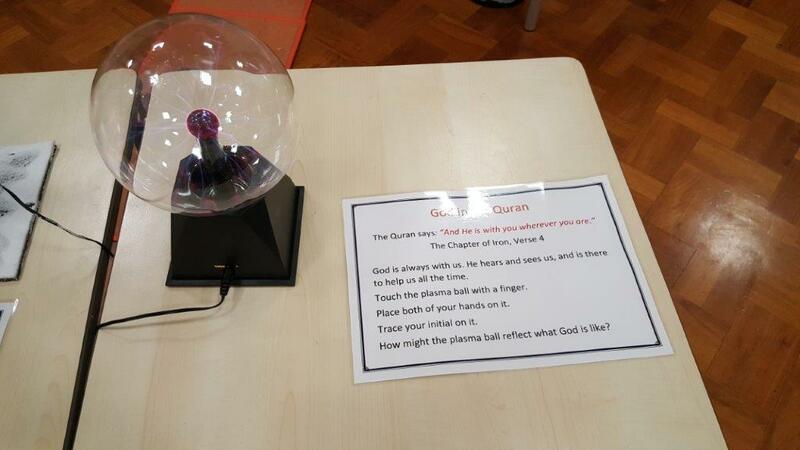 The Holy Quran was likened to the Holy books they may have heard of, such as the Bible. 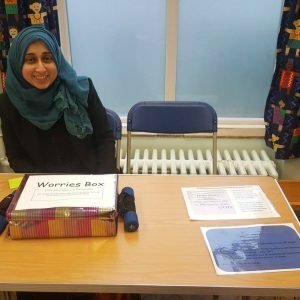 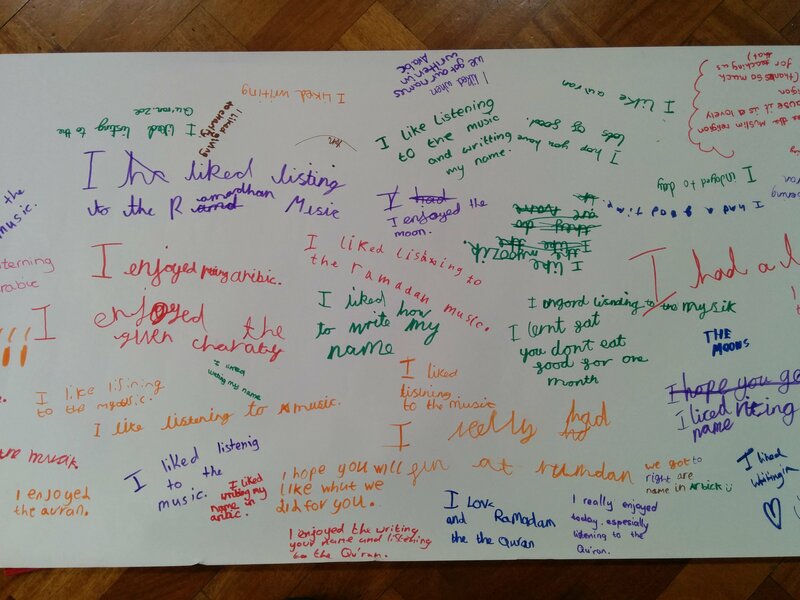 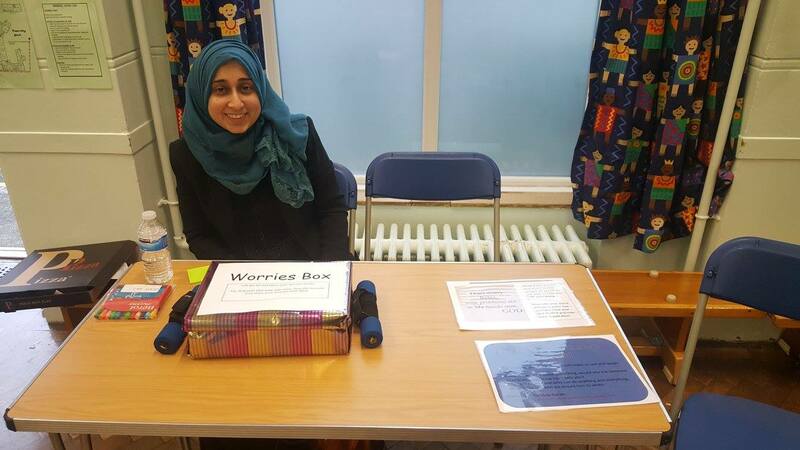 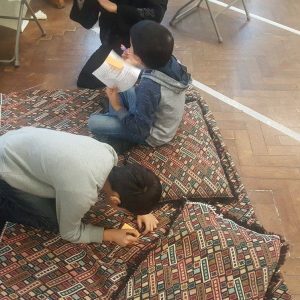 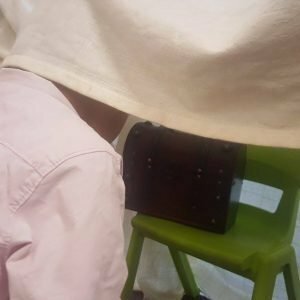 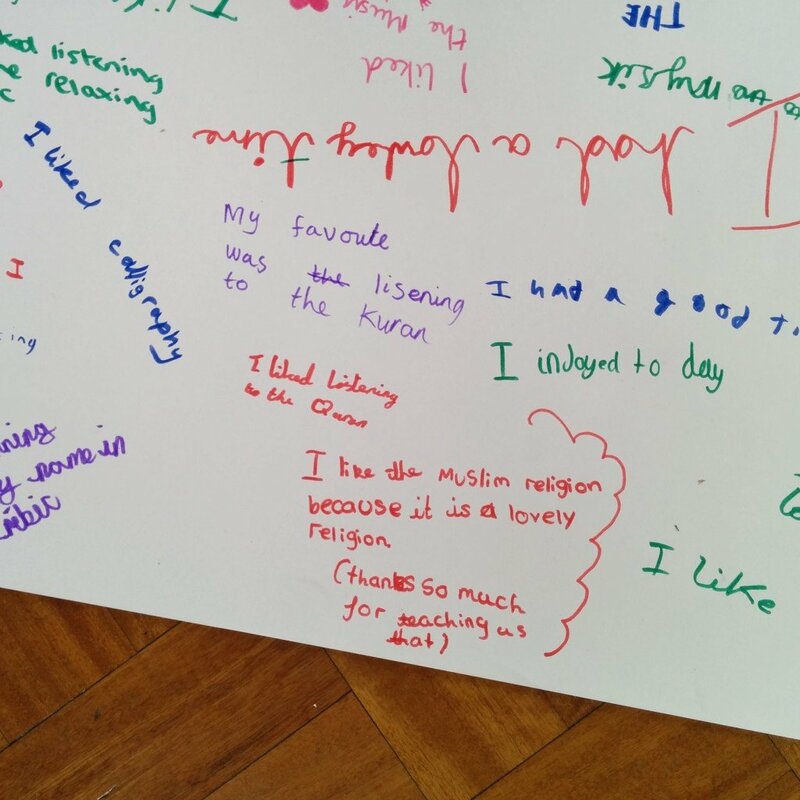 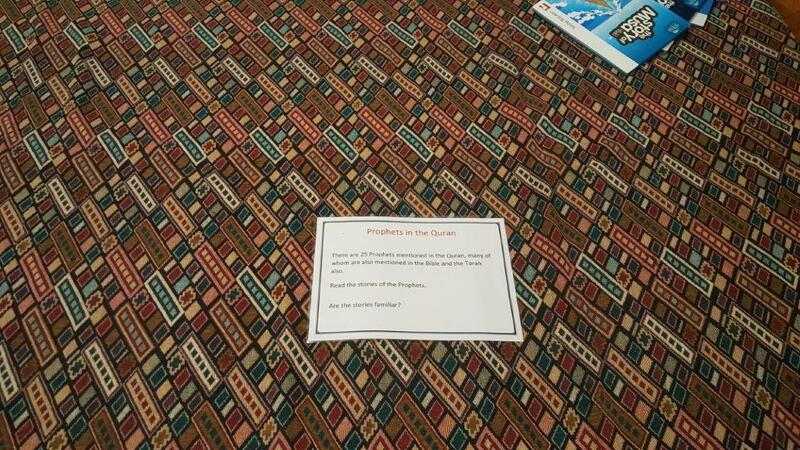 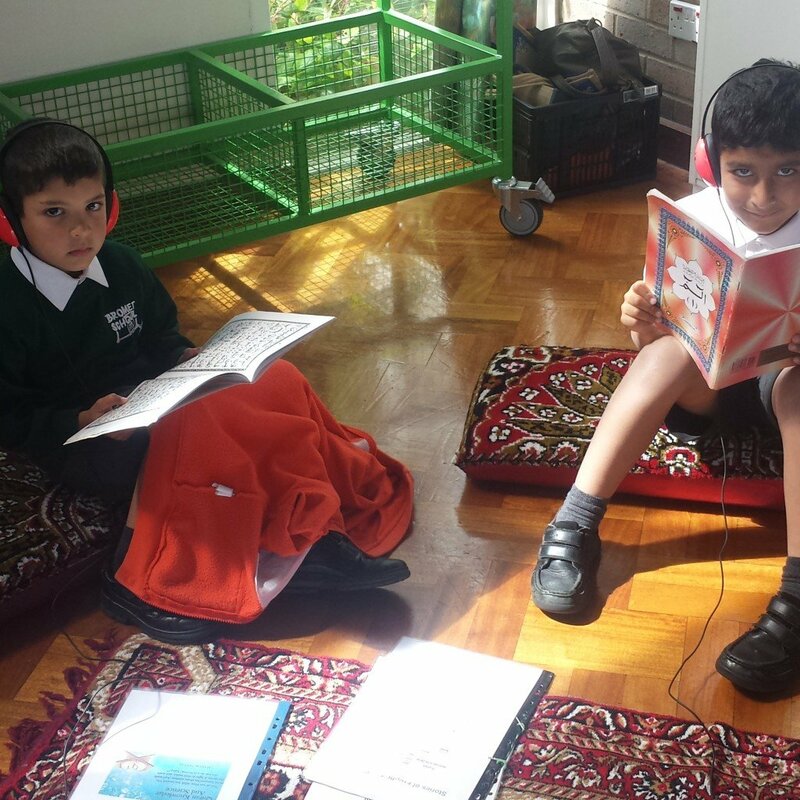 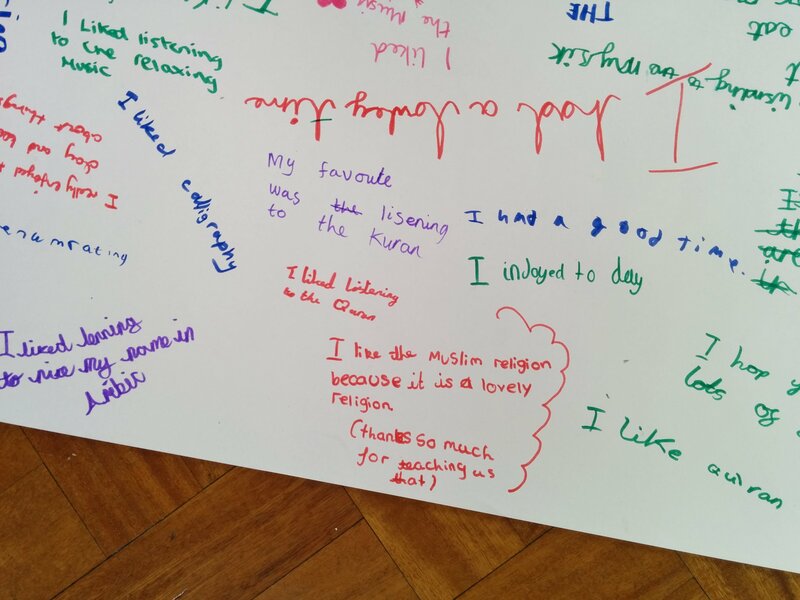 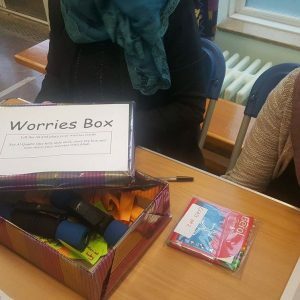 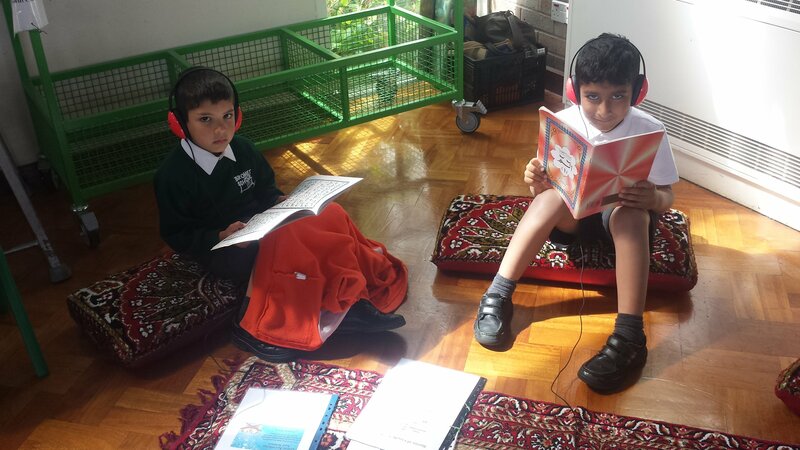 They had an opportunity to look at a Quran and also listen to the recitation on some iPads and then share how they felt – some of the feedback was amazing on this: “When I listen to the Quran it feels like it’s taking all my troubles away.” Many said they found it soothing and calming, and they often didn’t want to stop! 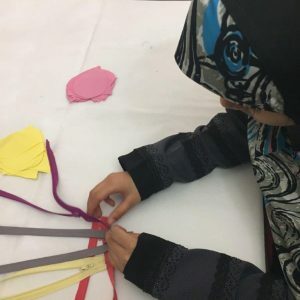 To introduce them to the content of the Quran, we made some simple booklets which they were briefly explained, and then had the opportunity to look into themselves. 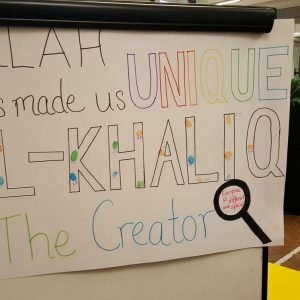 These were – Science in the Quran, Morals in the Quran (e.g. 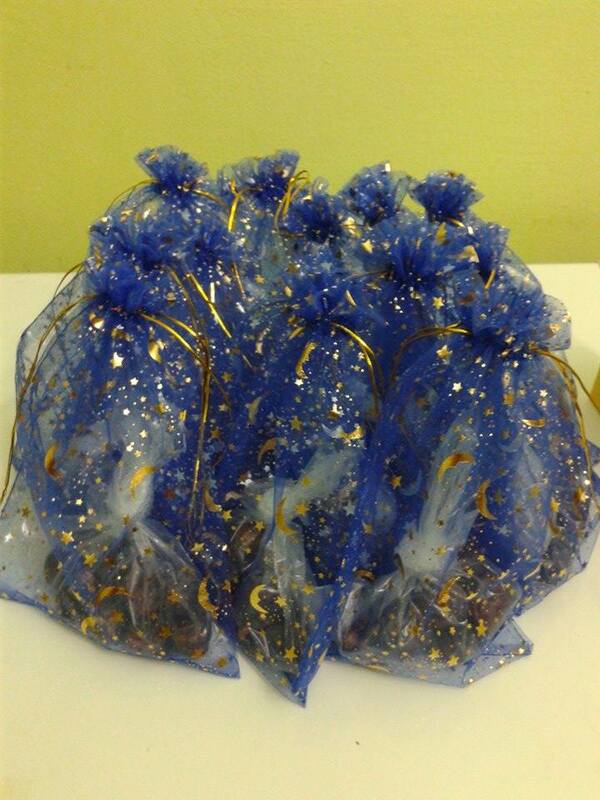 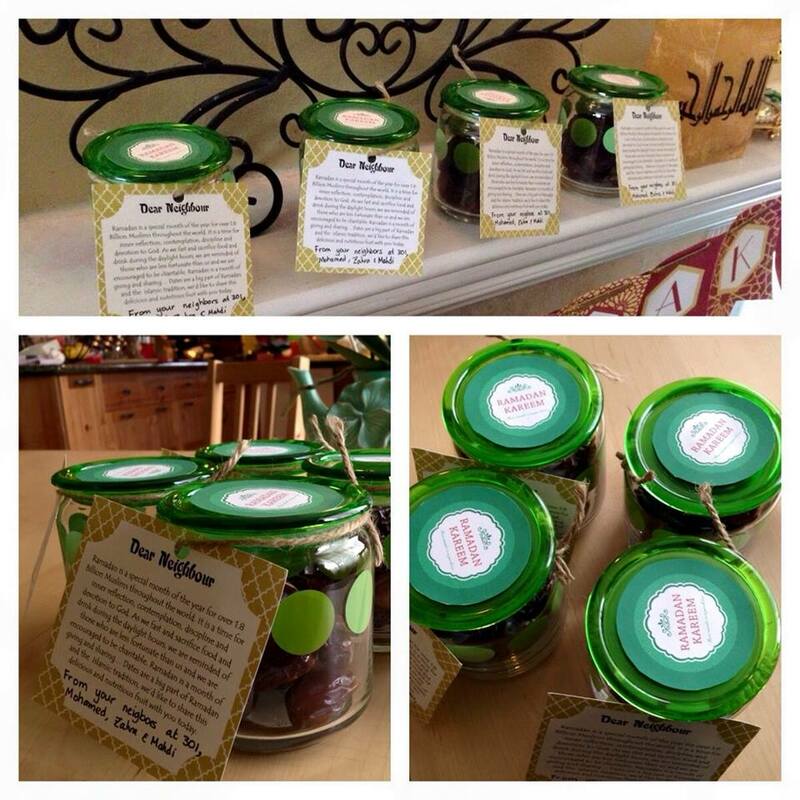 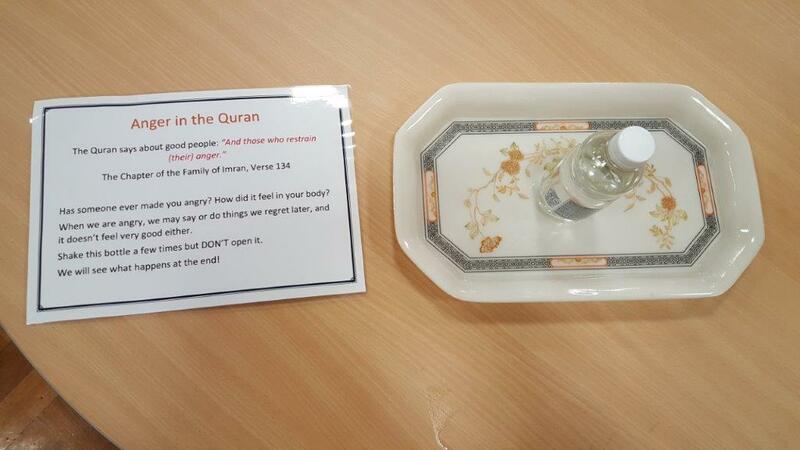 respecting elders and teachers, being nice, smiling) and Stories of Prophets from the Quran. 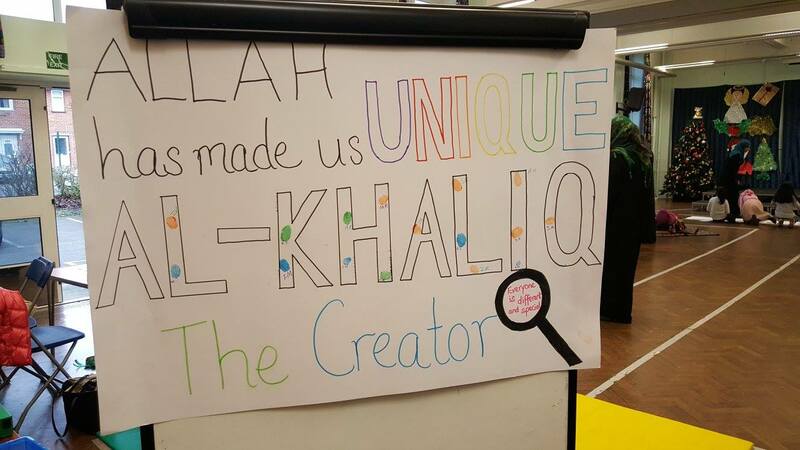 We invited a calligraphy artist to come into school for this program! 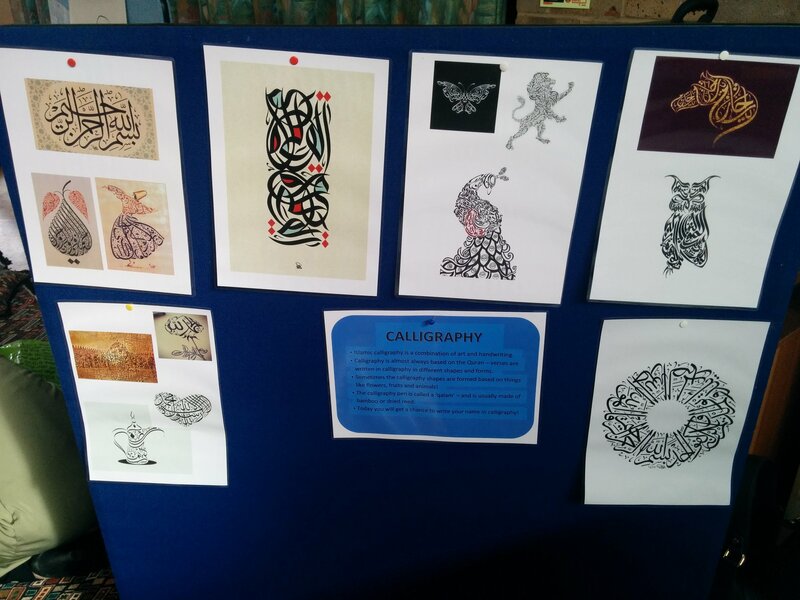 The art of calligraphy was introduced, and the fact that it was most often done from verses in the Holy Quran. 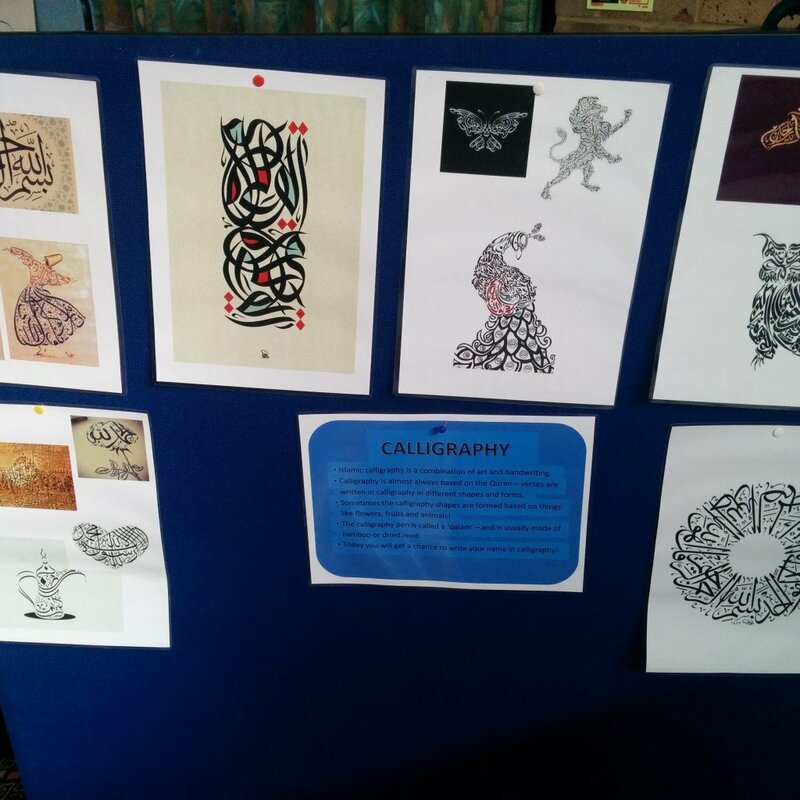 Lots of pictures were up on display for them to see the different recognisable shapes that could be made up by calligraphy, such as animals and fruits. 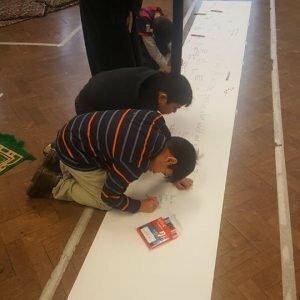 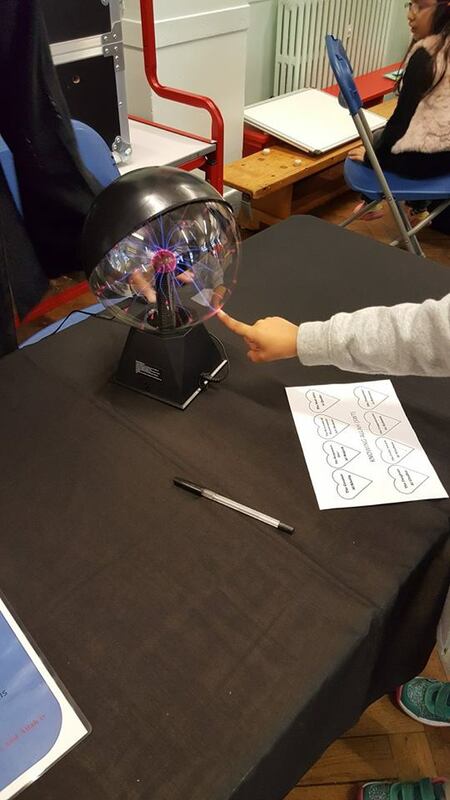 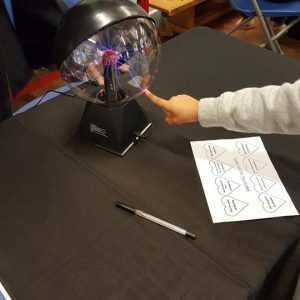 The artist then sketched their names in Arabic in pencil, and the children traced over this with calligraphy markers, learning how to manoeuvre the pens, and make the diamond dots. 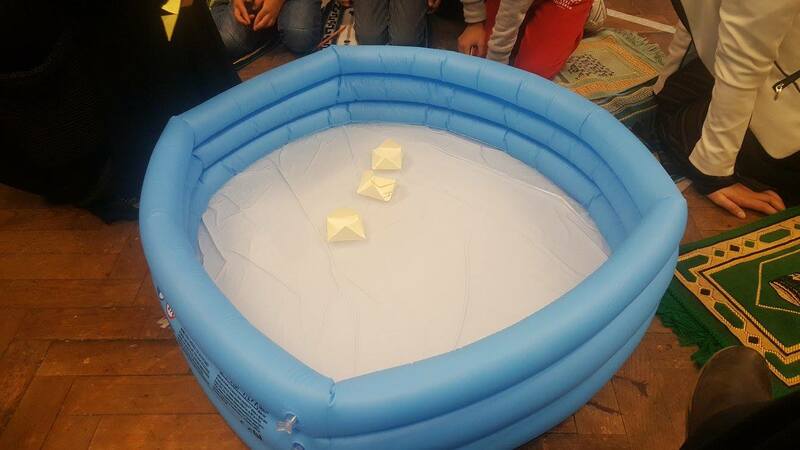 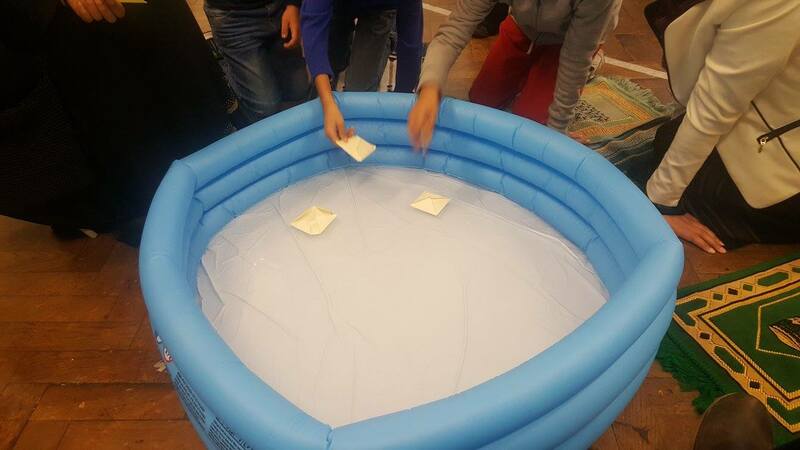 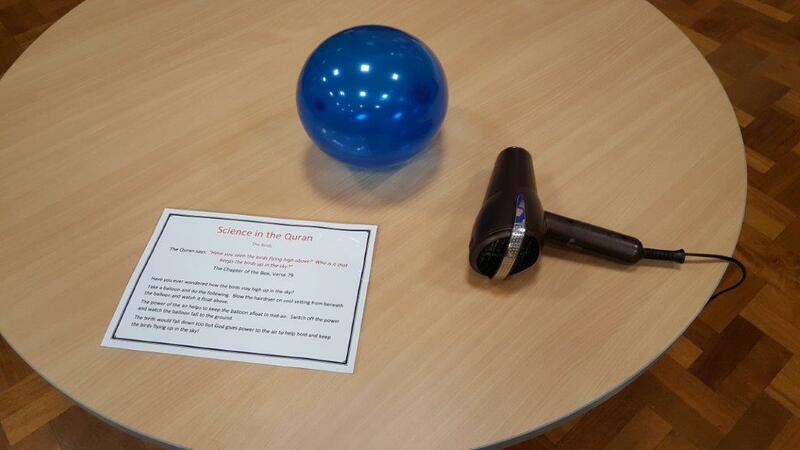 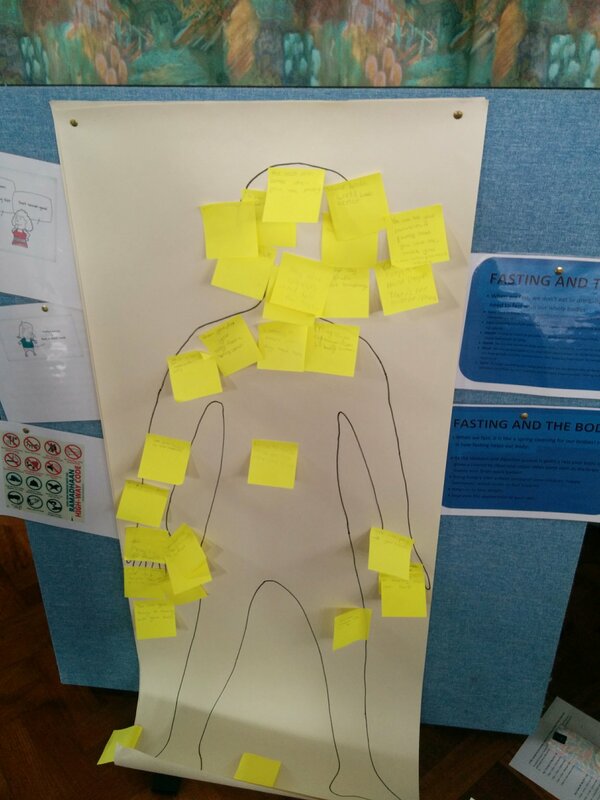 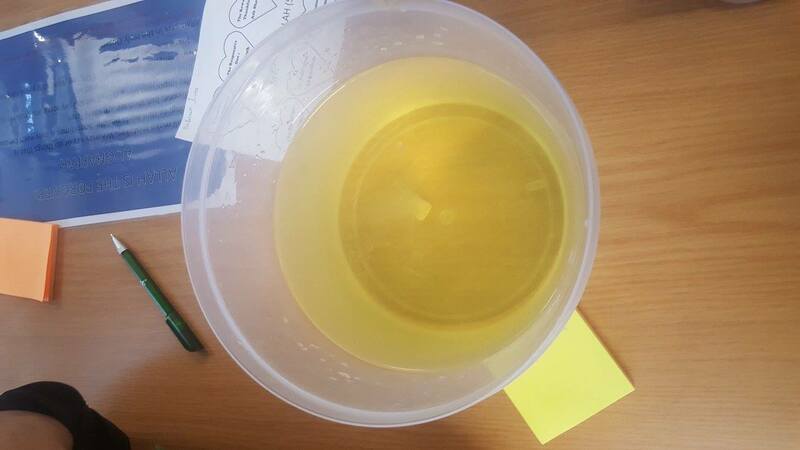 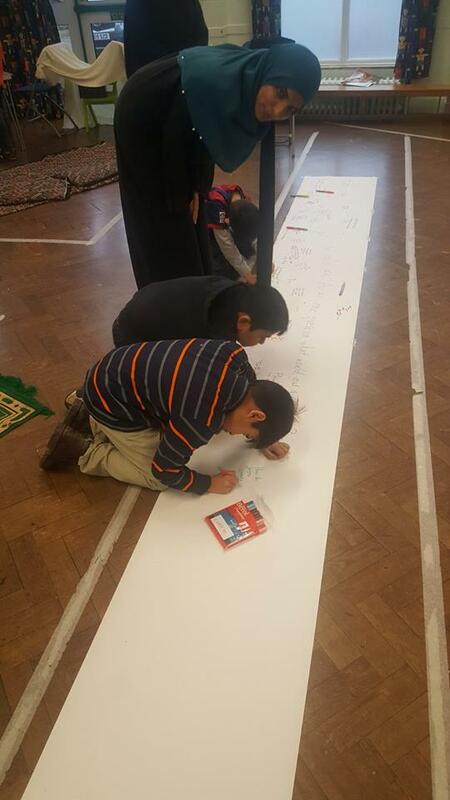 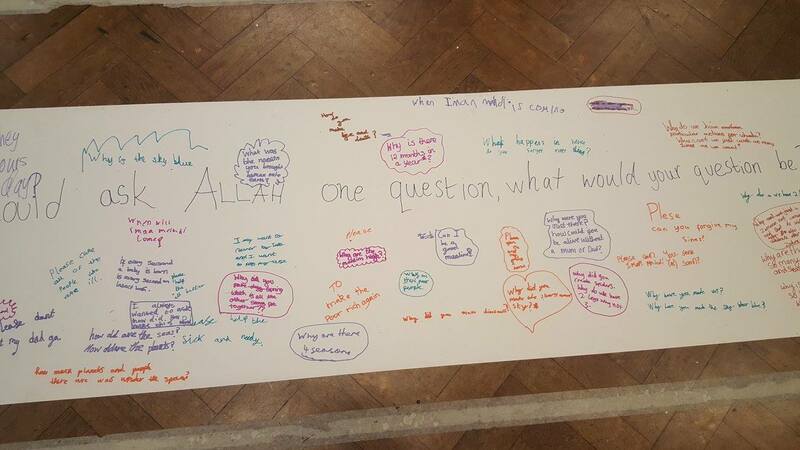 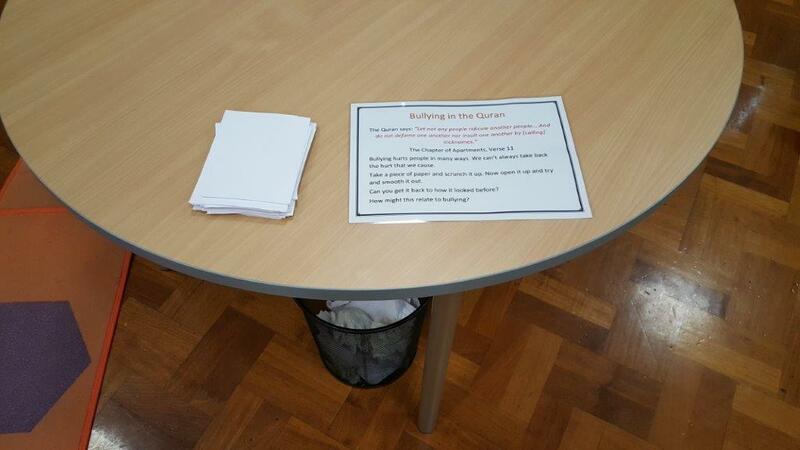 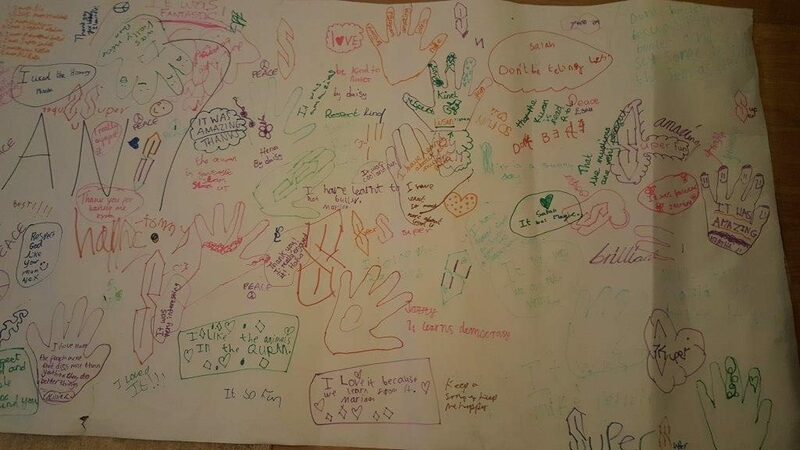 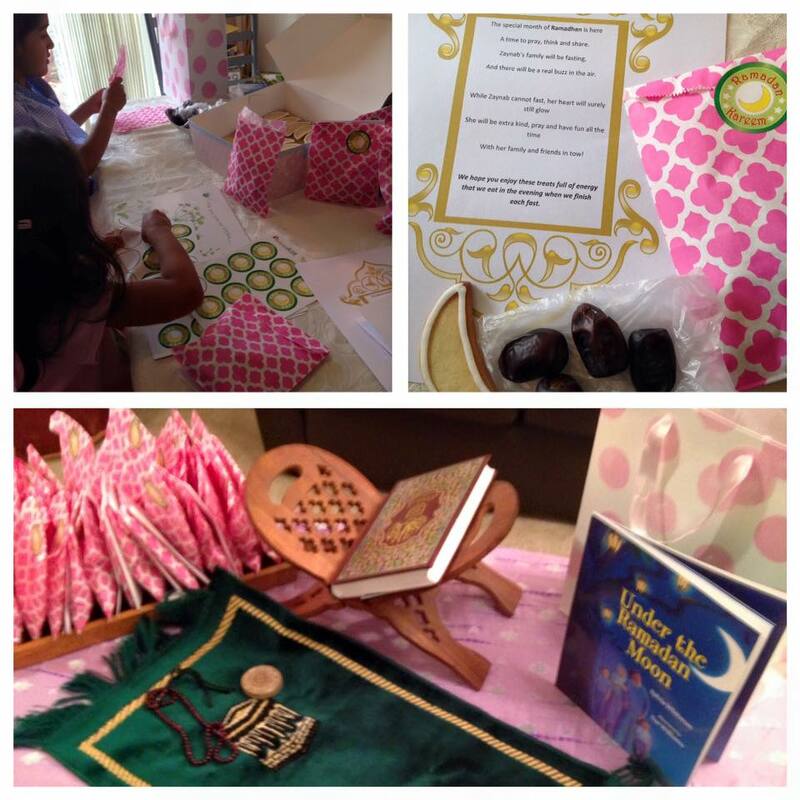 This (and listening to the Quran) was by far one of the most popular activities of the day! 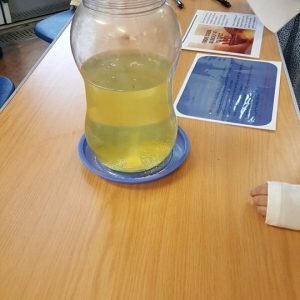 There were two parts to this station. 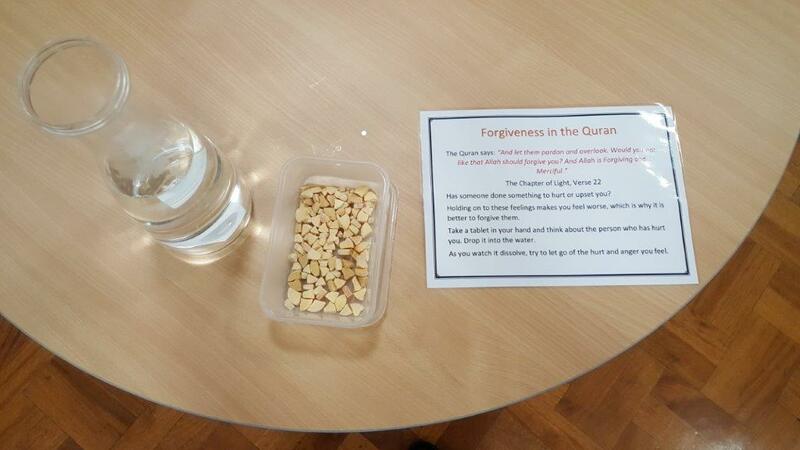 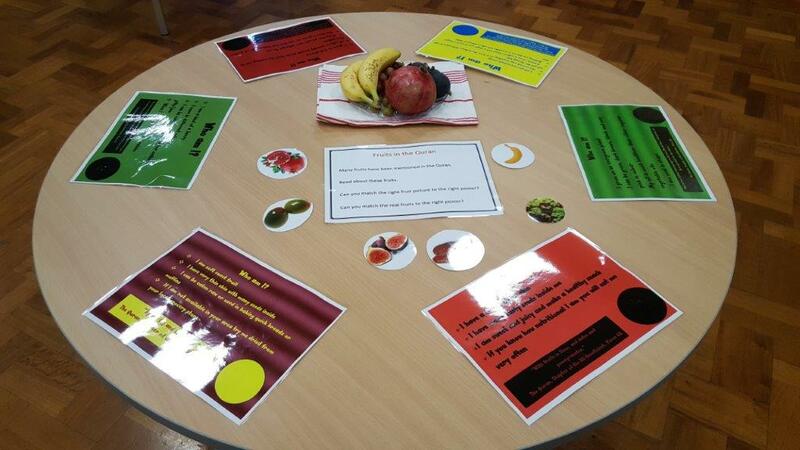 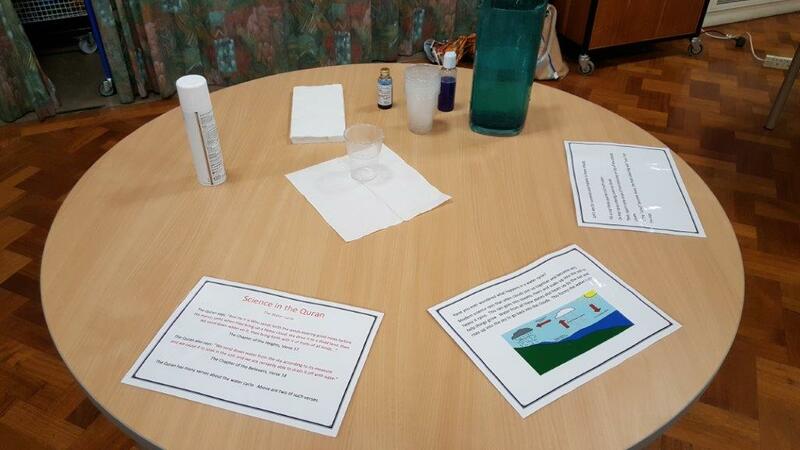 Firstly, they looked at how fasting is good for the body and how it affects us positively. 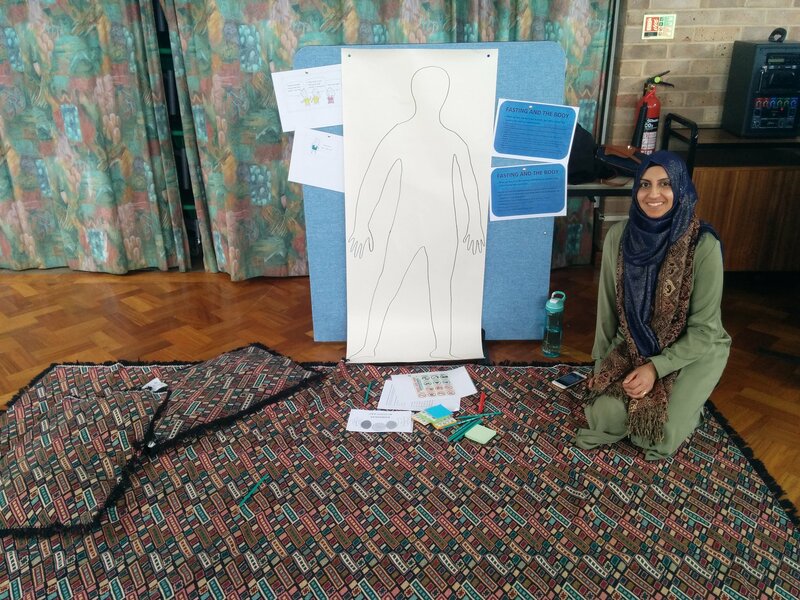 Secondly, they looked at how fasting is not just about eating or drinking, but how we need to fast with our whole bodies (e.g. 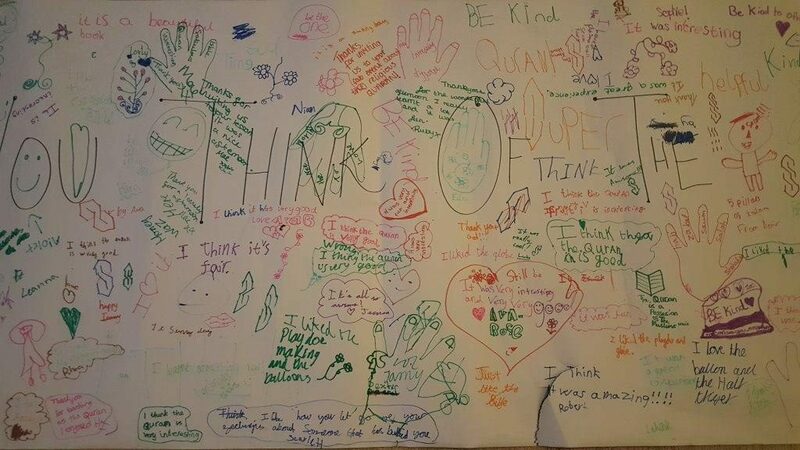 not hitting with hands). 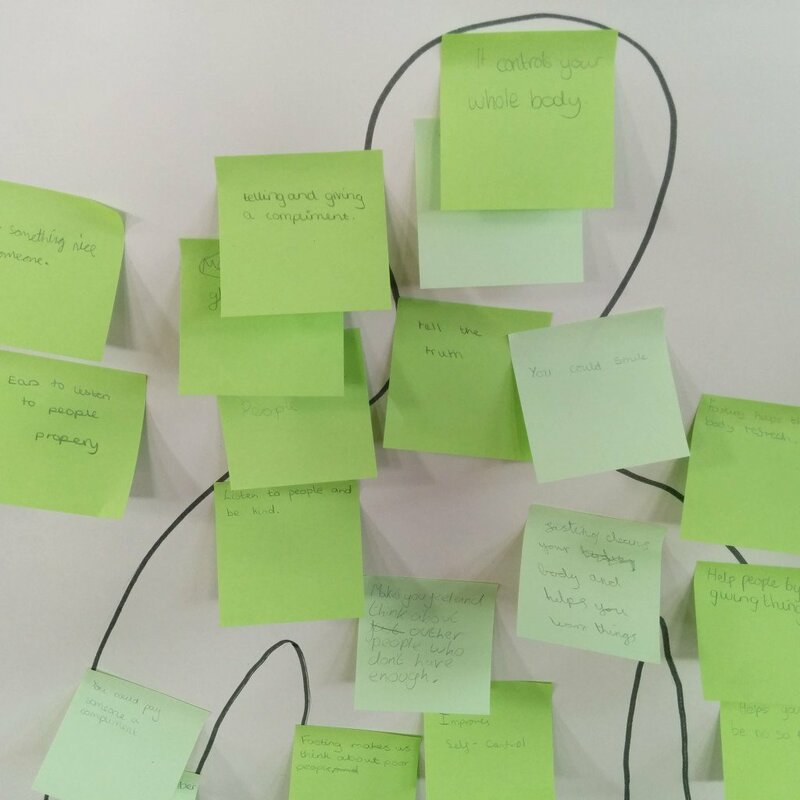 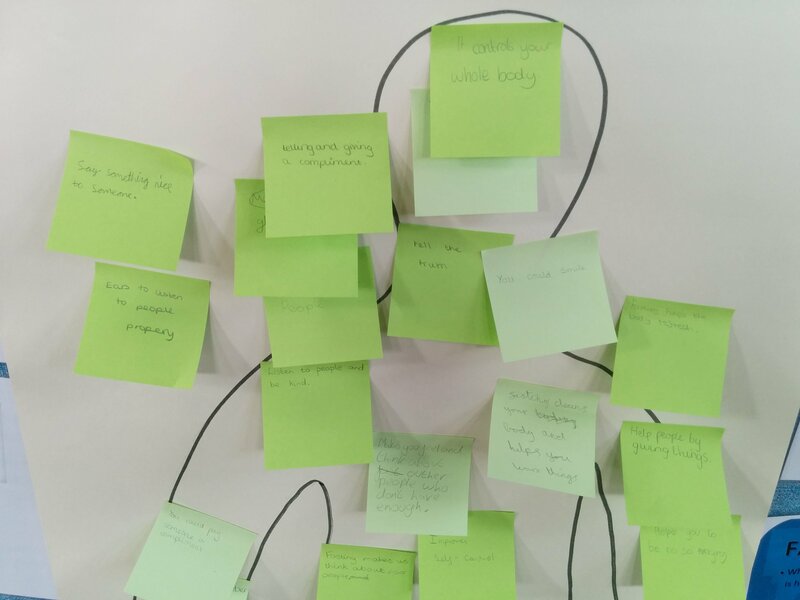 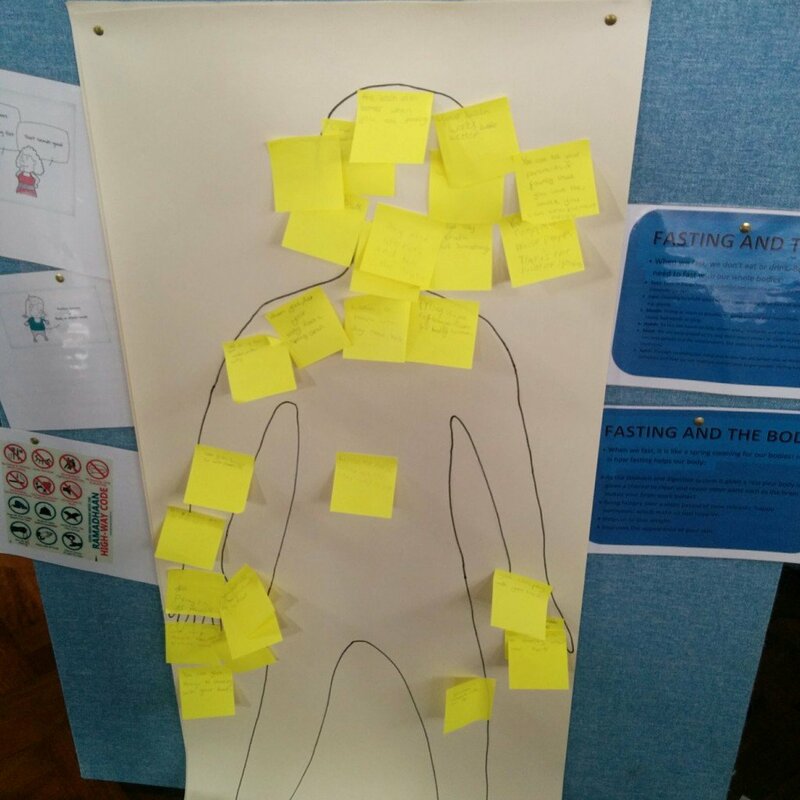 On post-it notes, children wrote how they thought fasting was done with a certain part of the body and then stuck it on a life-sized body chart. 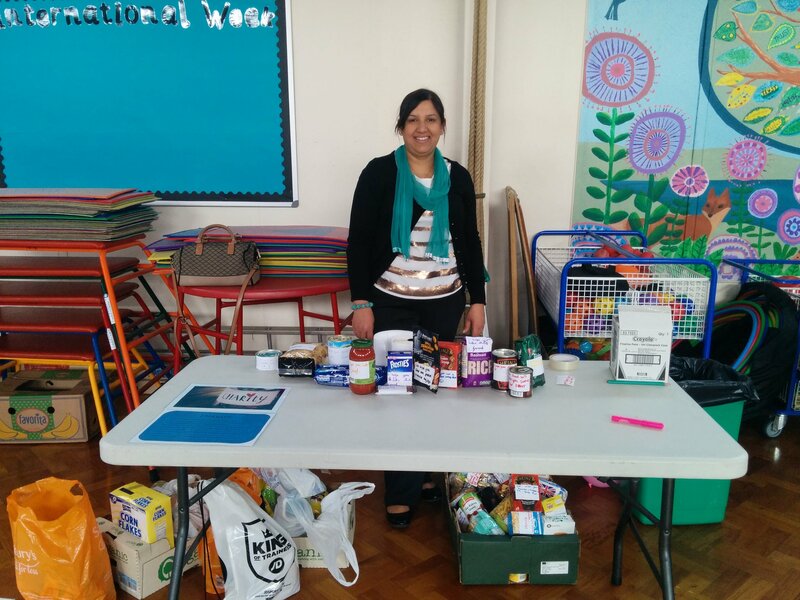 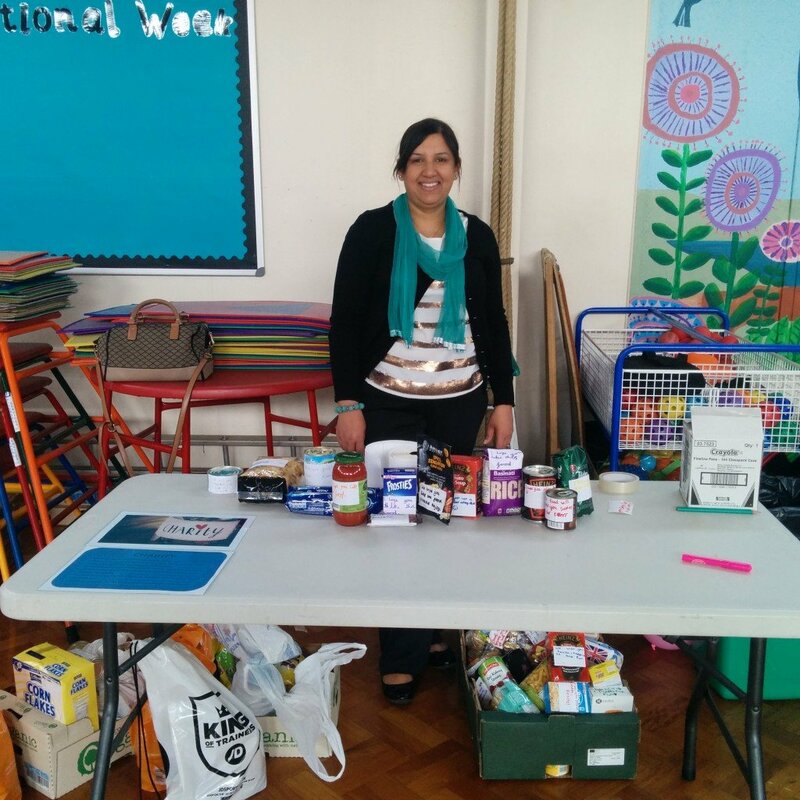 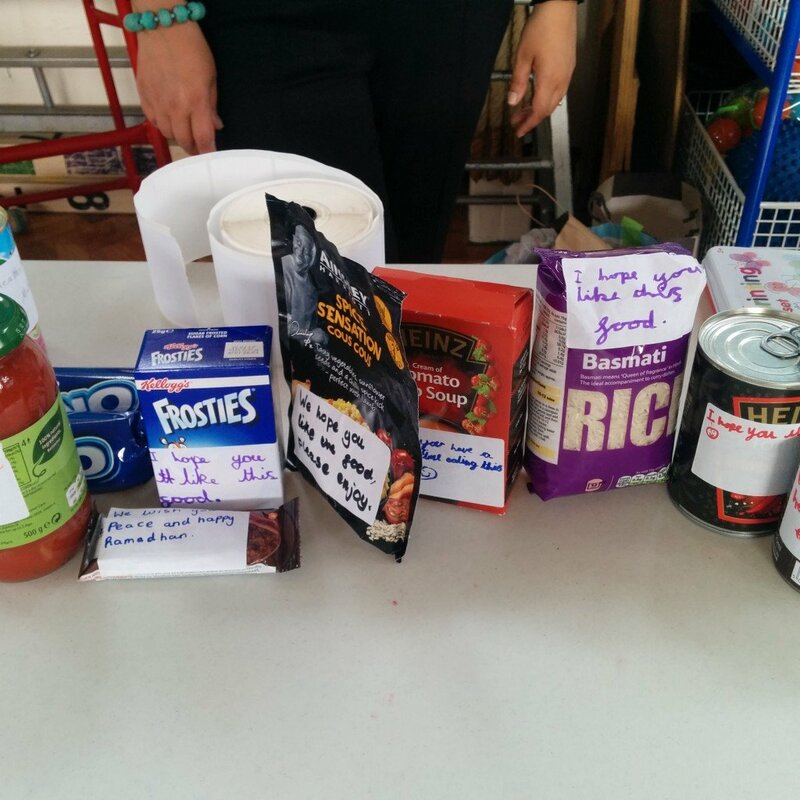 A letter to the parents had gone out, requesting certain food items to be brought in for this day. 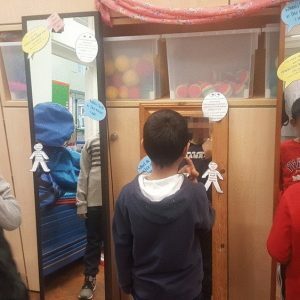 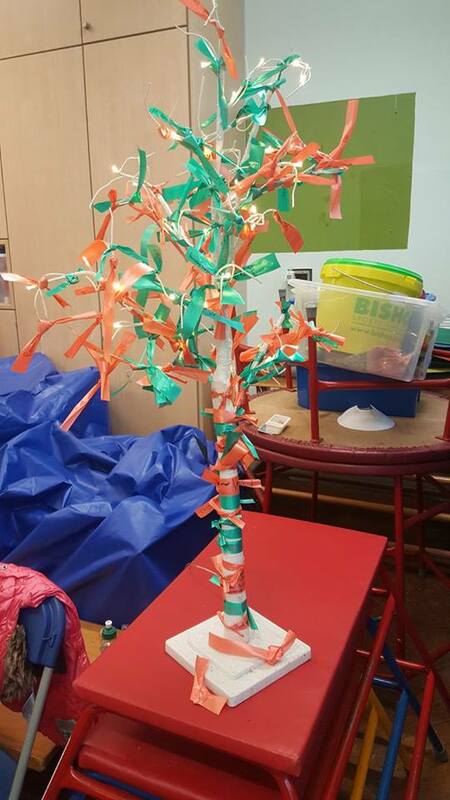 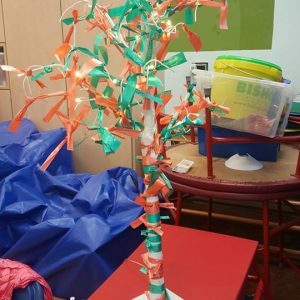 When the children came to this station, they discussed the concept of charity and that so many in this world don’t have enough, even in the UK today. 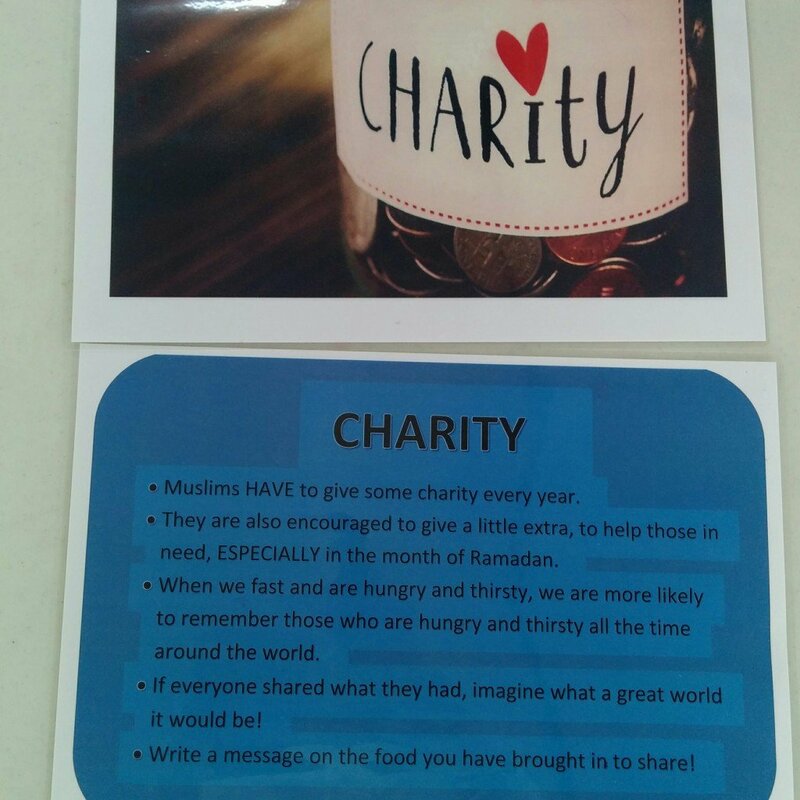 They talked about food banks and what they do, and how fasting helps us empathise more with those that don’t have enough food. 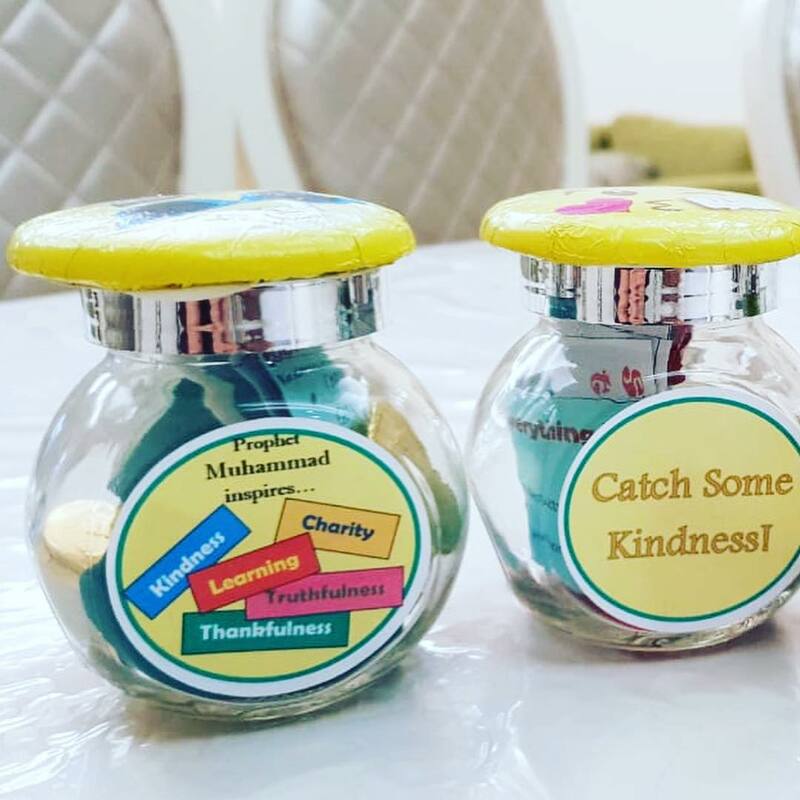 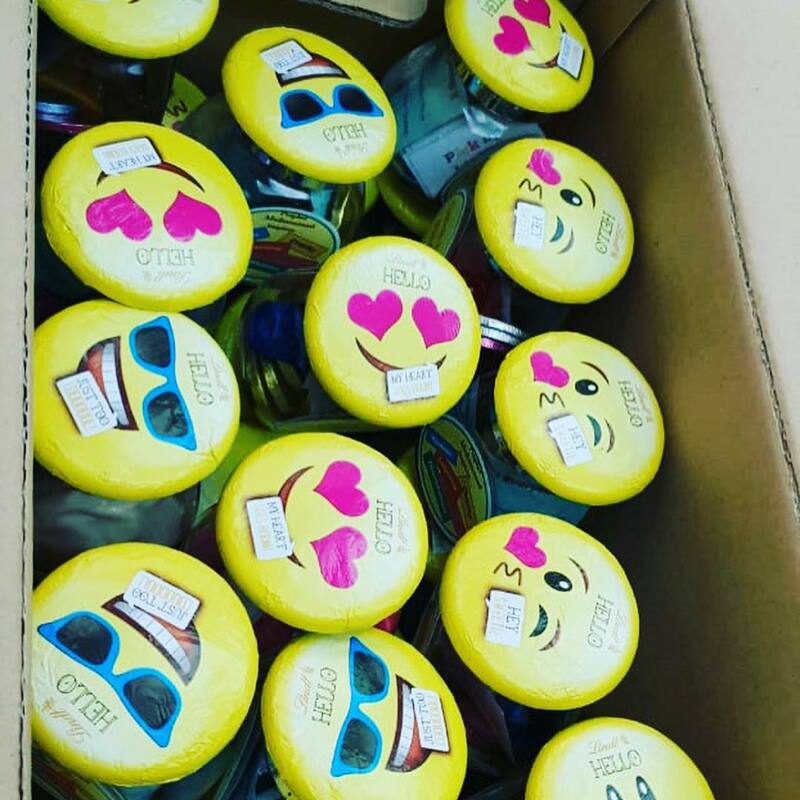 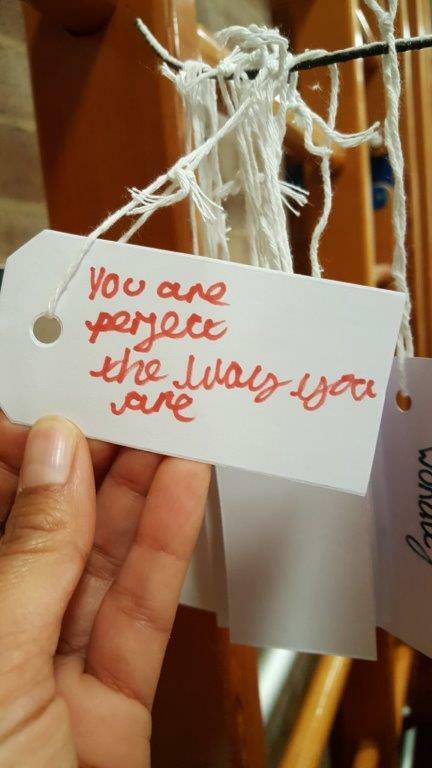 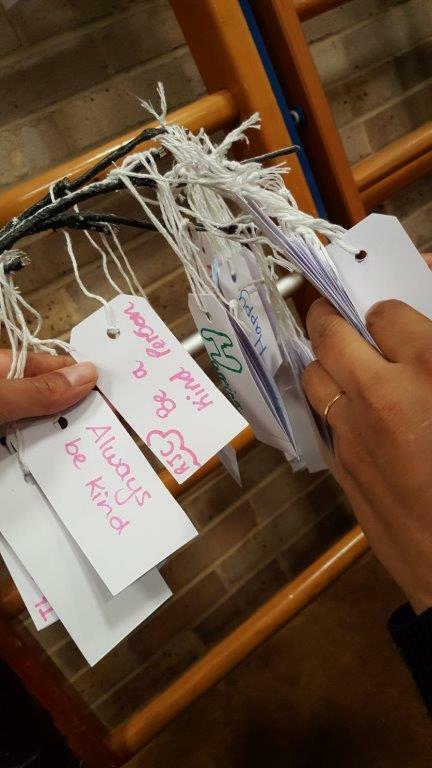 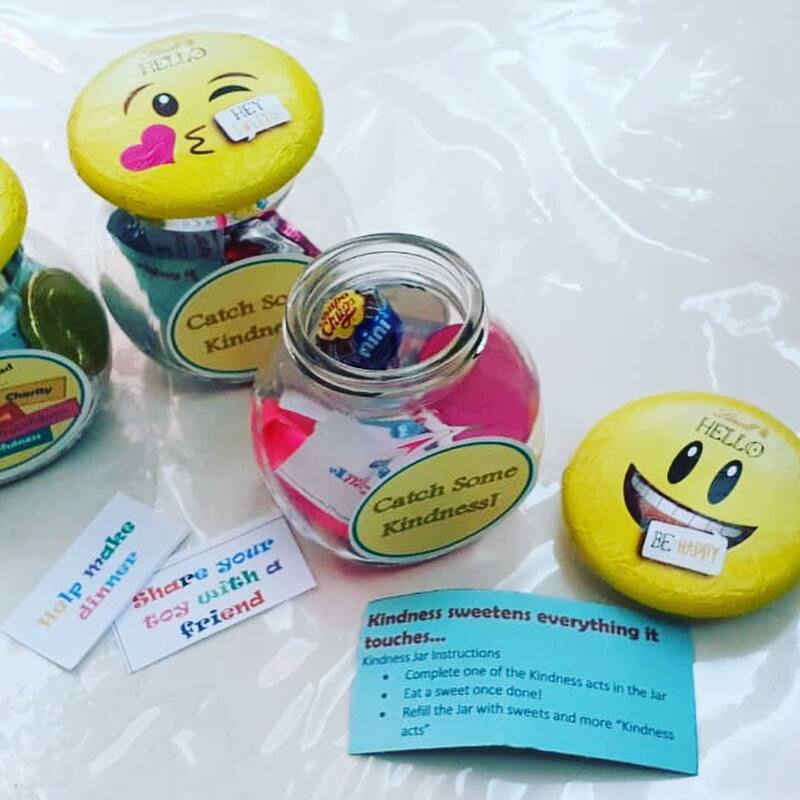 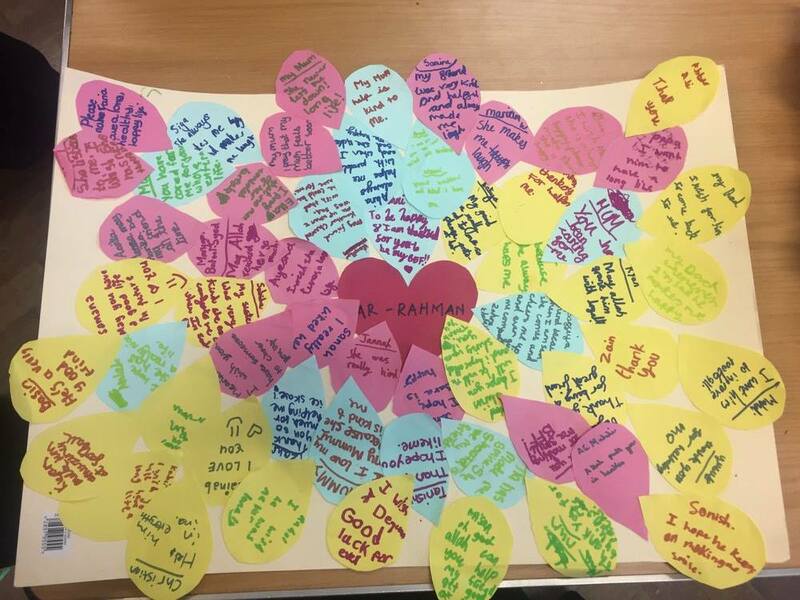 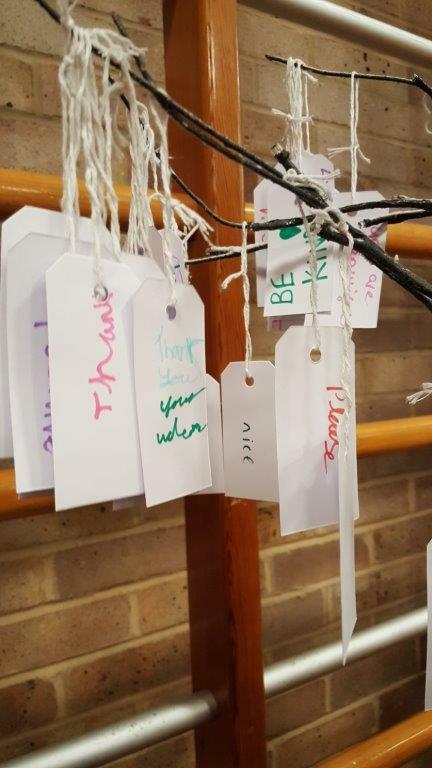 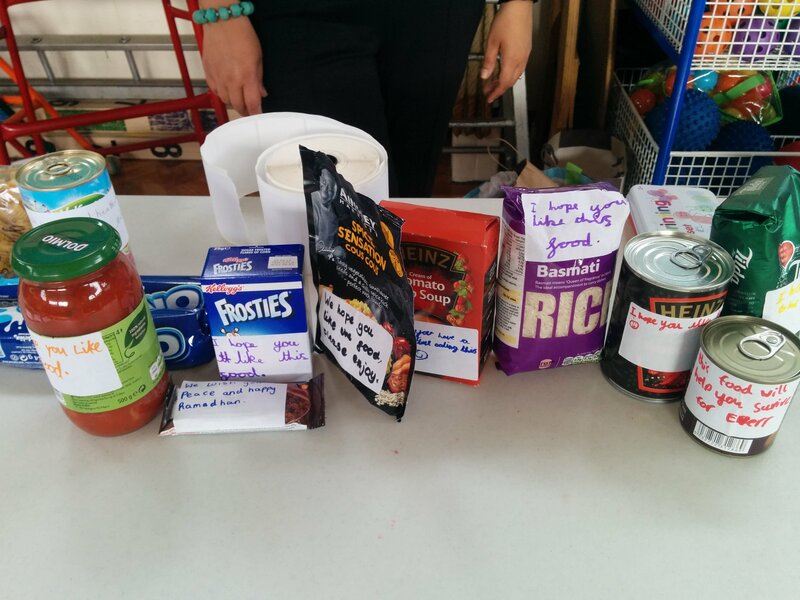 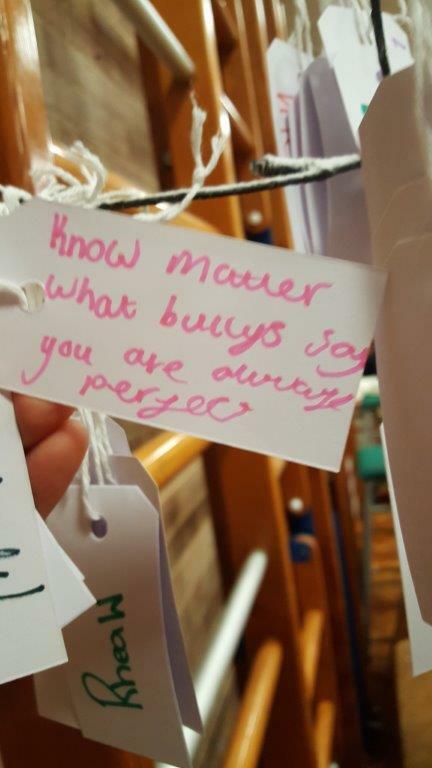 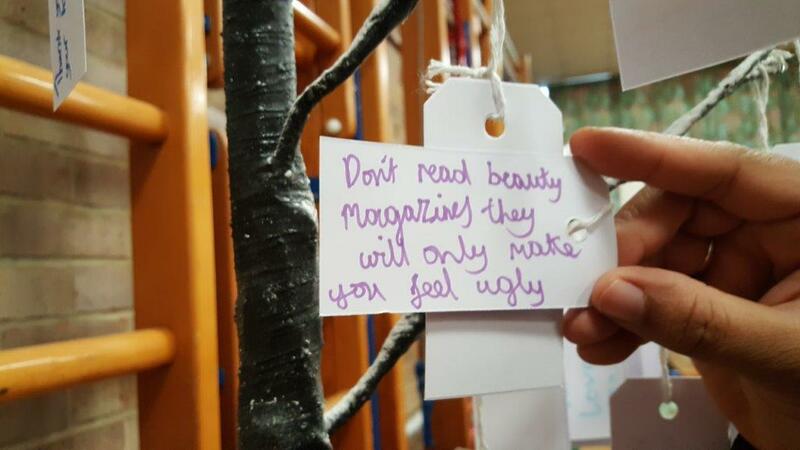 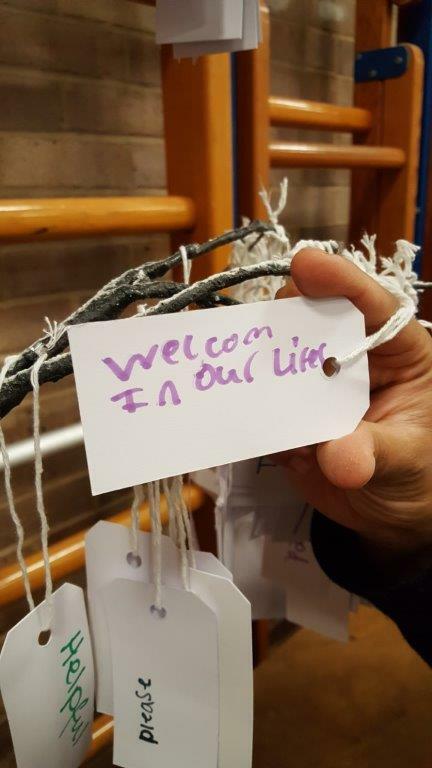 They were also made to think about the fact that as well as handouts, many people who are suffering also just want to know that people remember them and are thinking about them, and so they wrote out little messages to the recipients of the food and stuck these on to the food items. 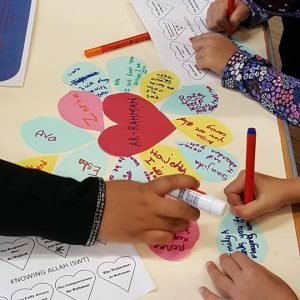 At this station, they talked about how Eid is a celebration – not because we don’t have to fast anymore, but because of the fact that after this month, we are hopefully better people! 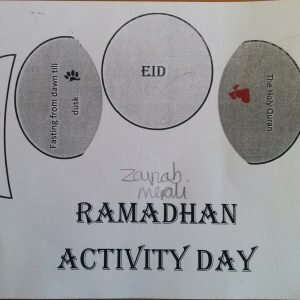 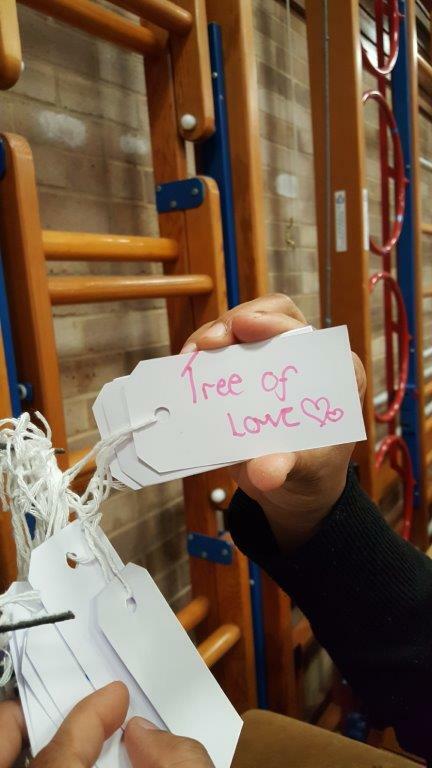 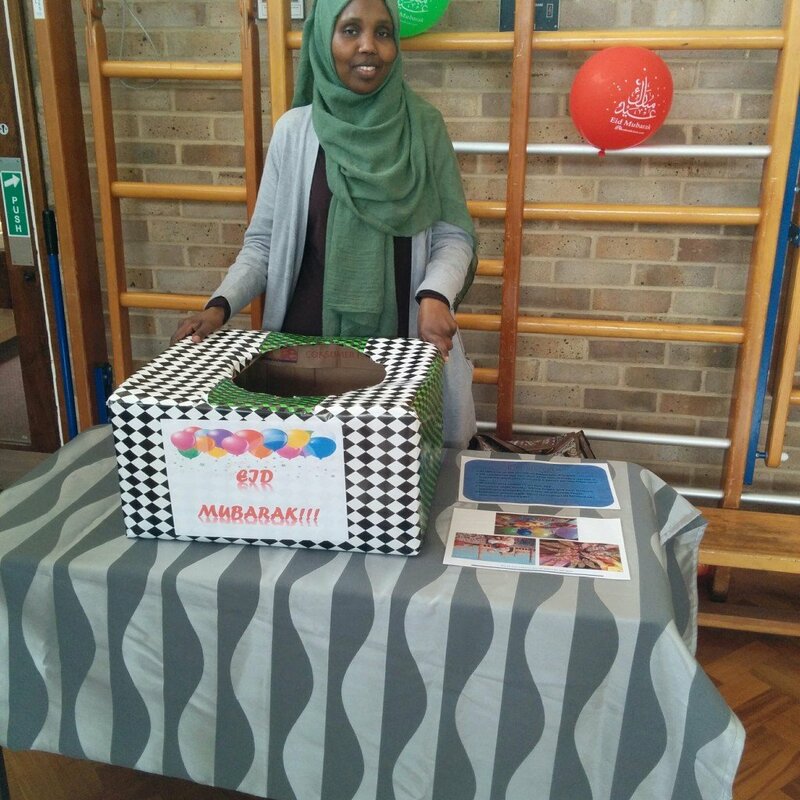 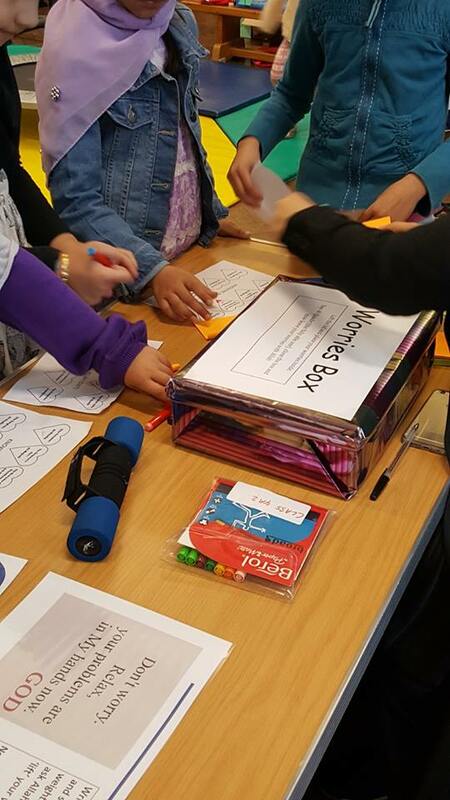 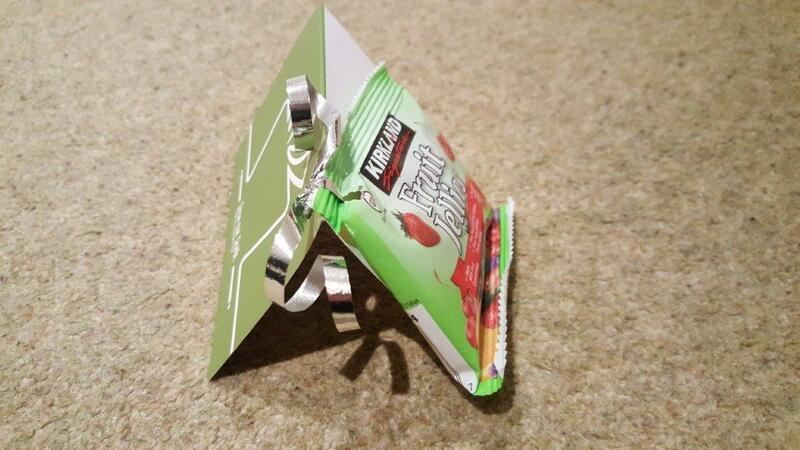 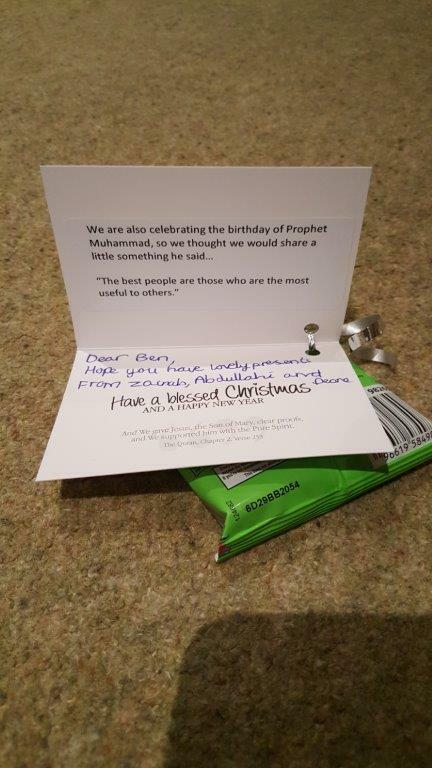 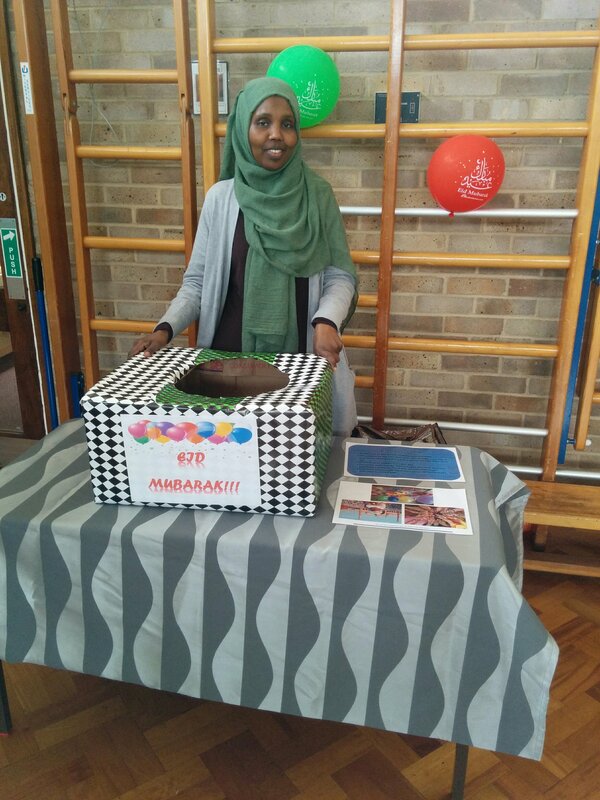 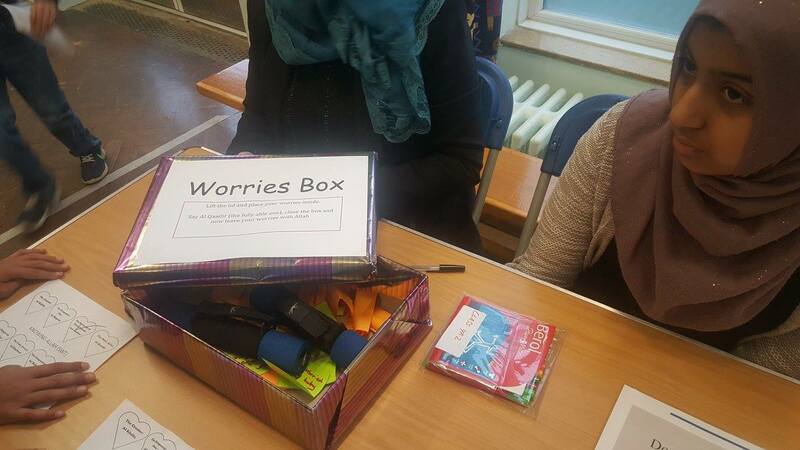 They discussed what people wear and do on this day, such as visit the mosque, visit family and exchange presents, and then were given a treat that they got to pick out from a Lucky Dip box. 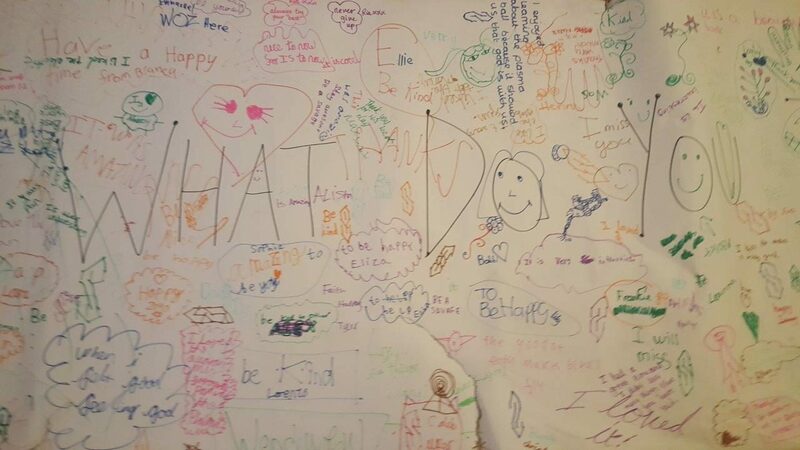 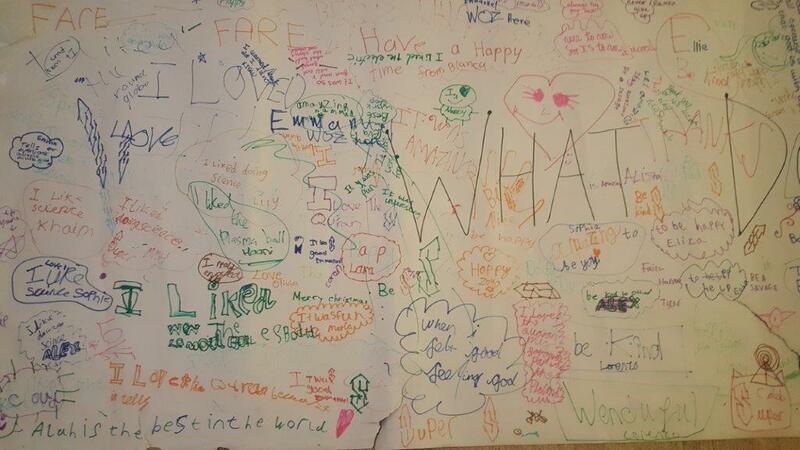 Once this was all done, they had an opportunity to write their thoughts down. 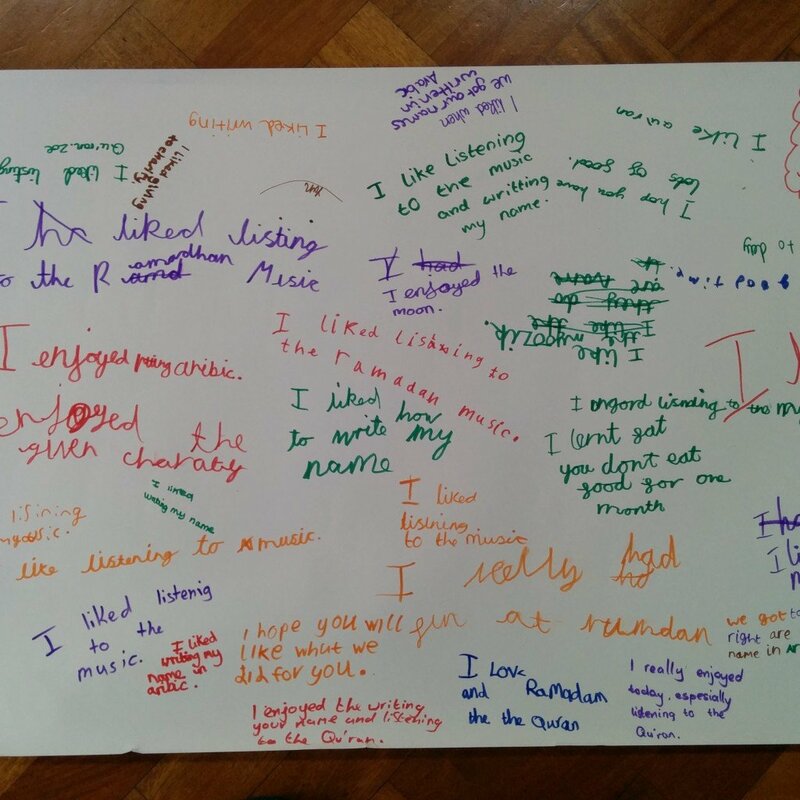 It was amazing to read their reflections! 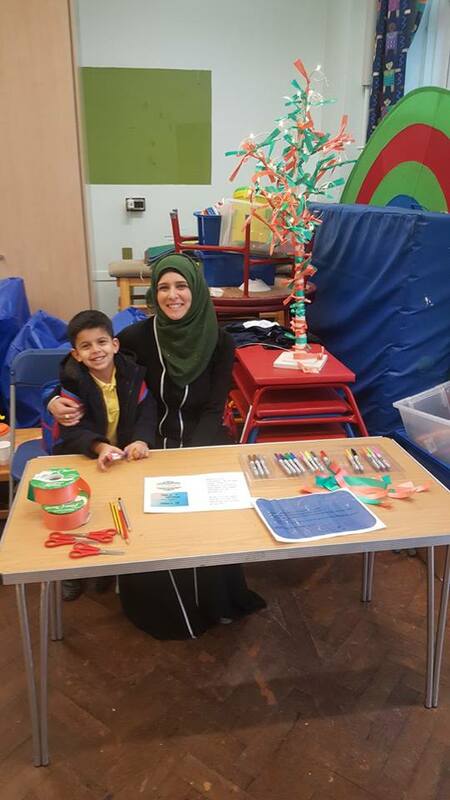 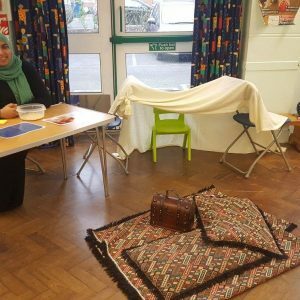 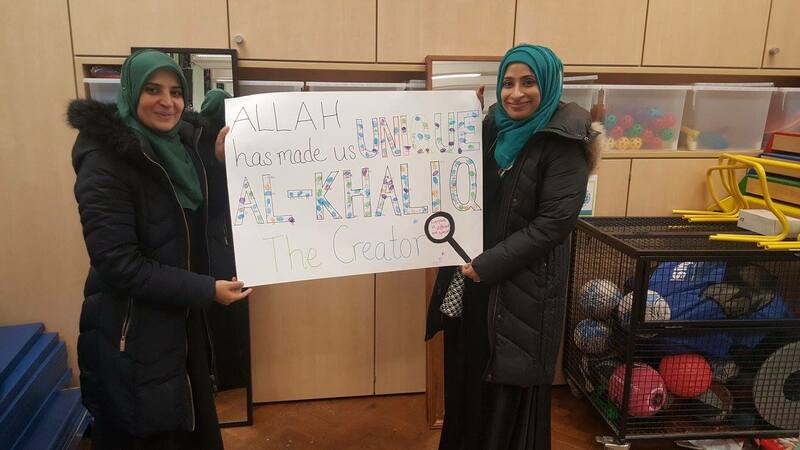 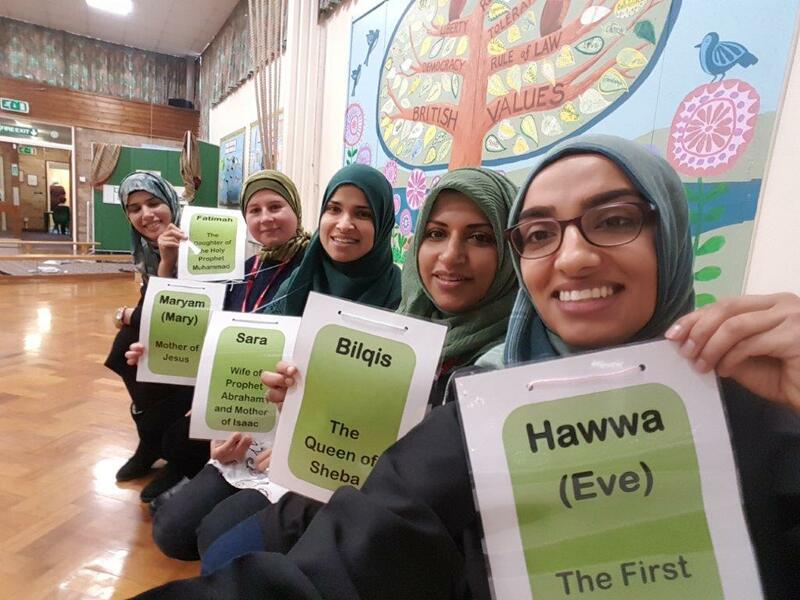 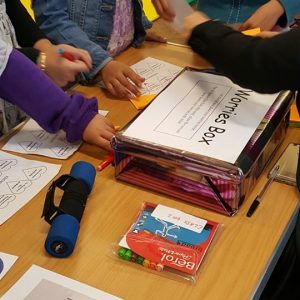 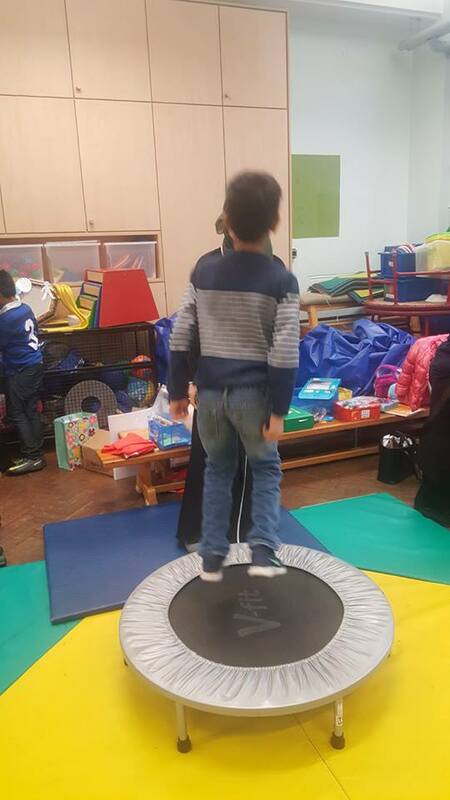 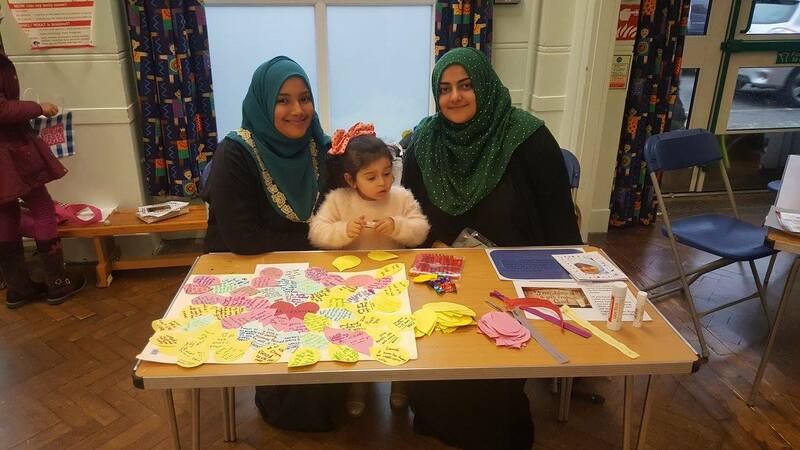 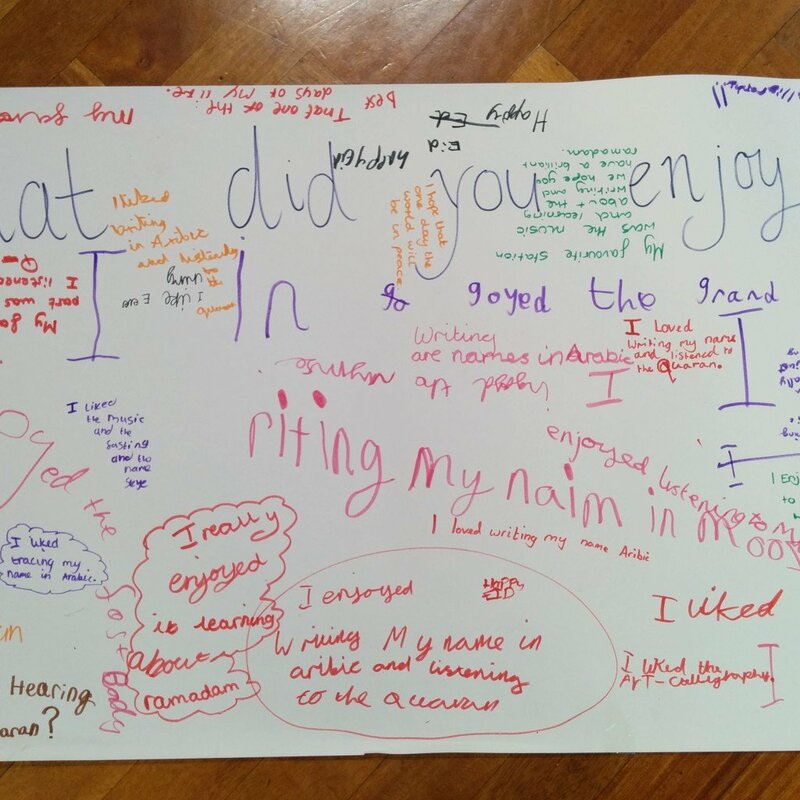 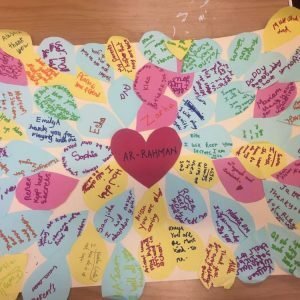 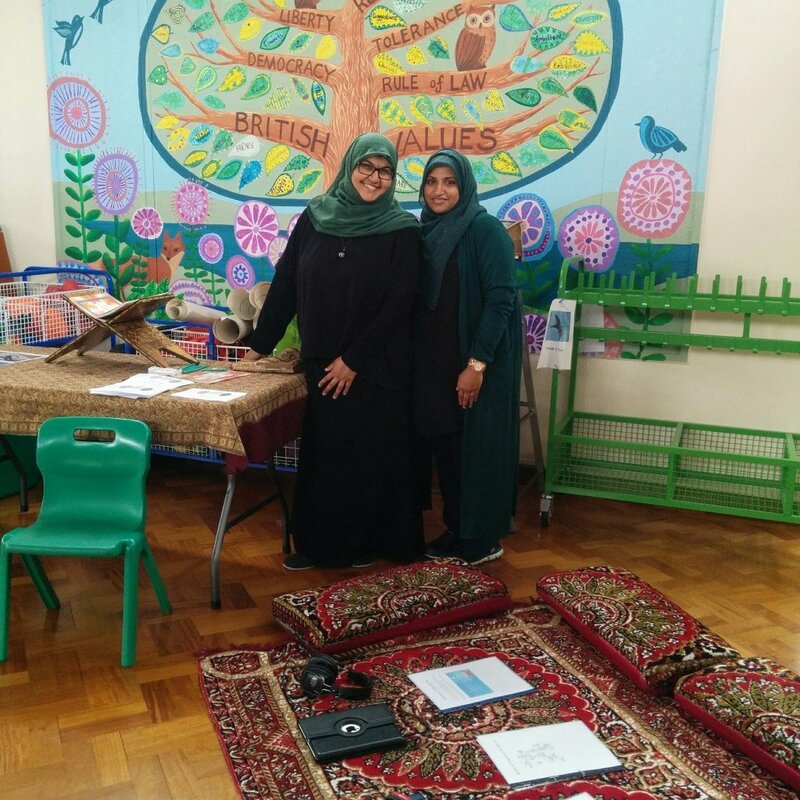 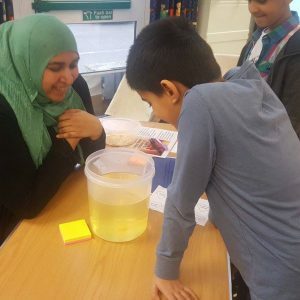 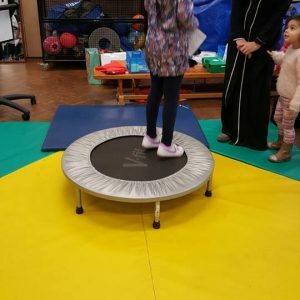 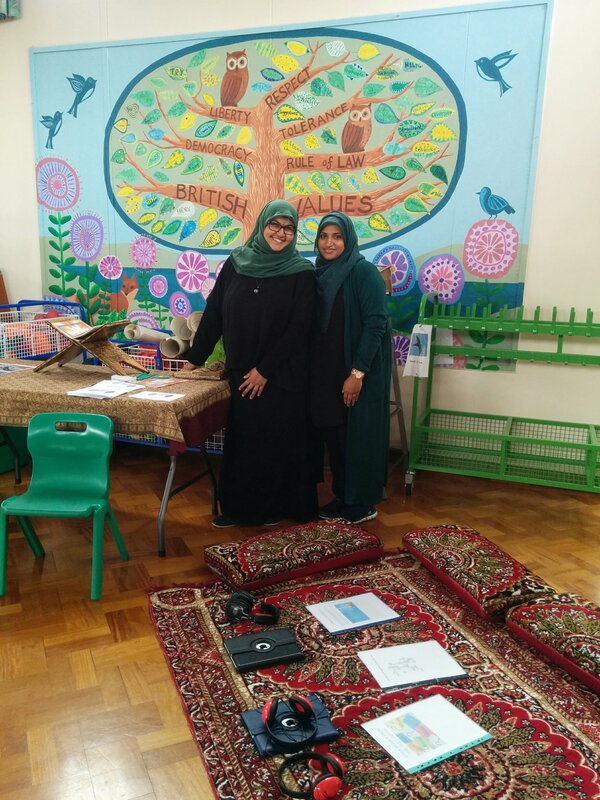 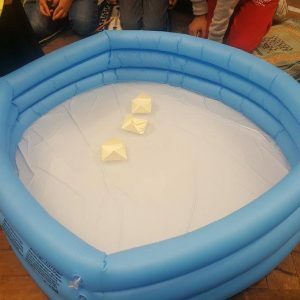 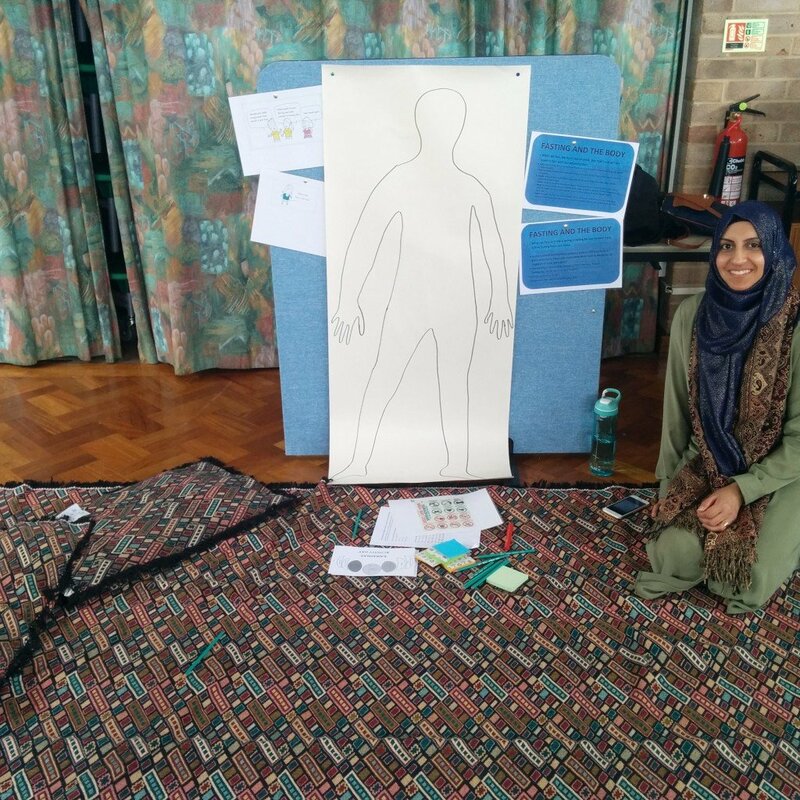 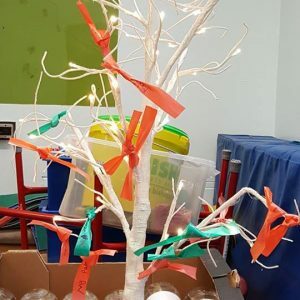 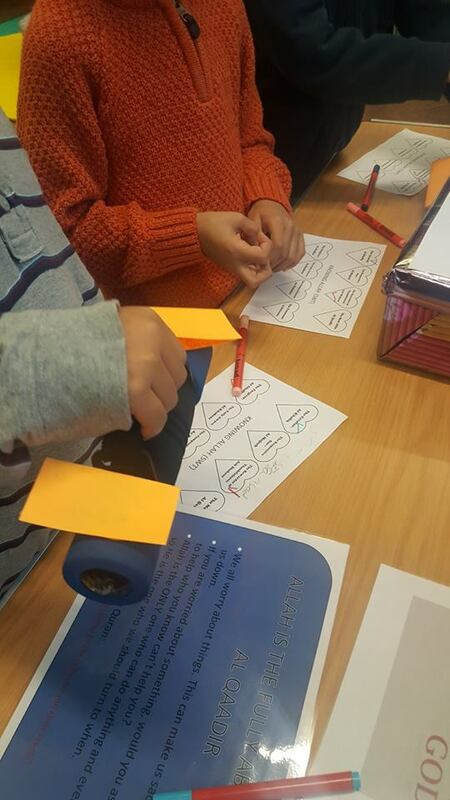 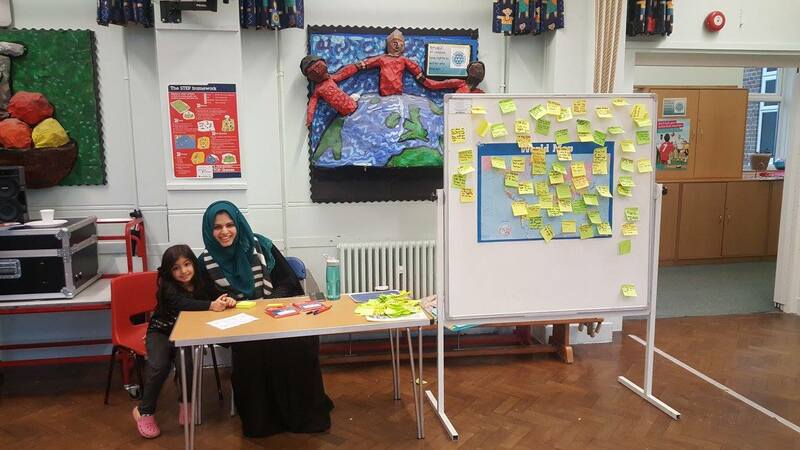 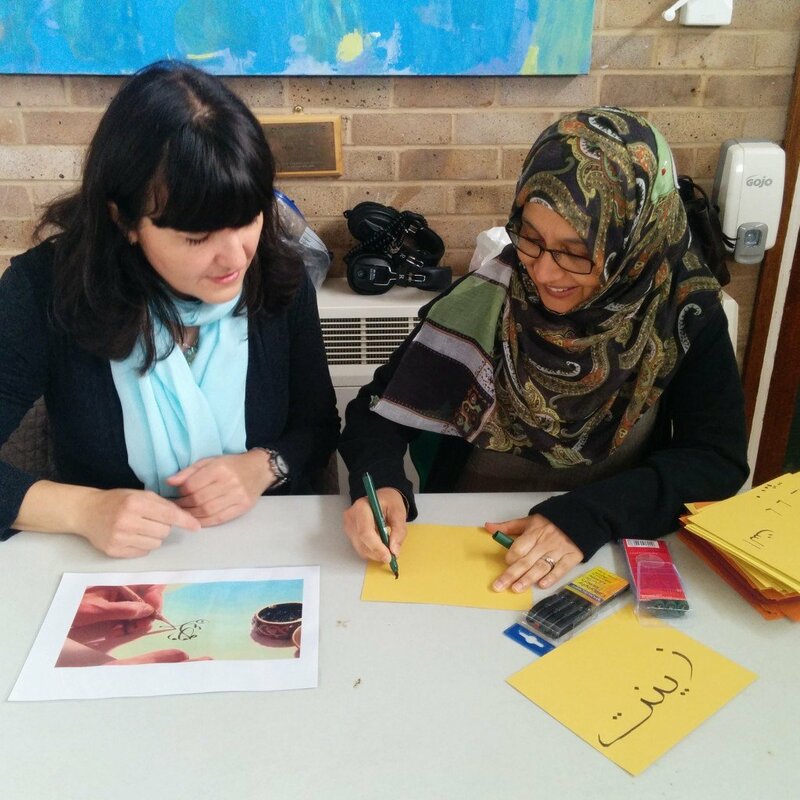 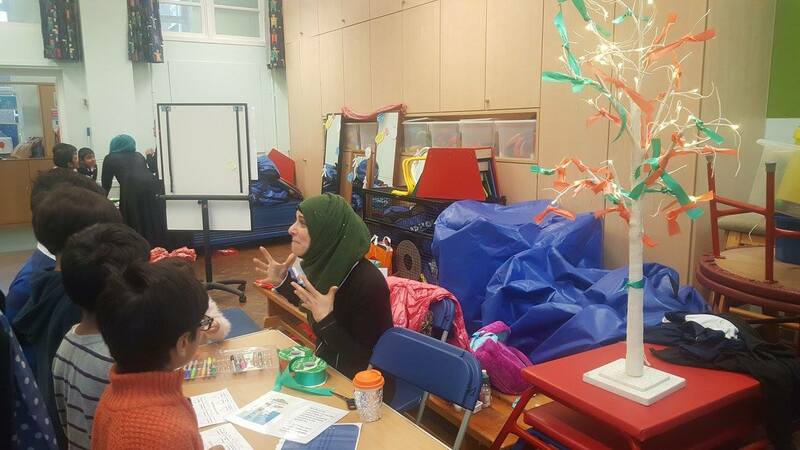 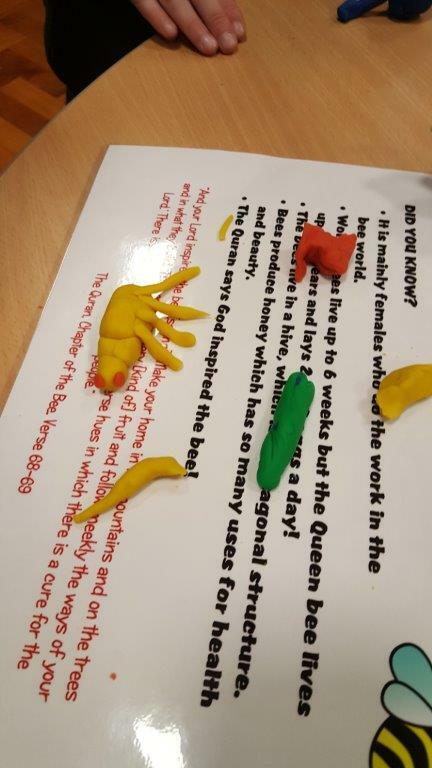 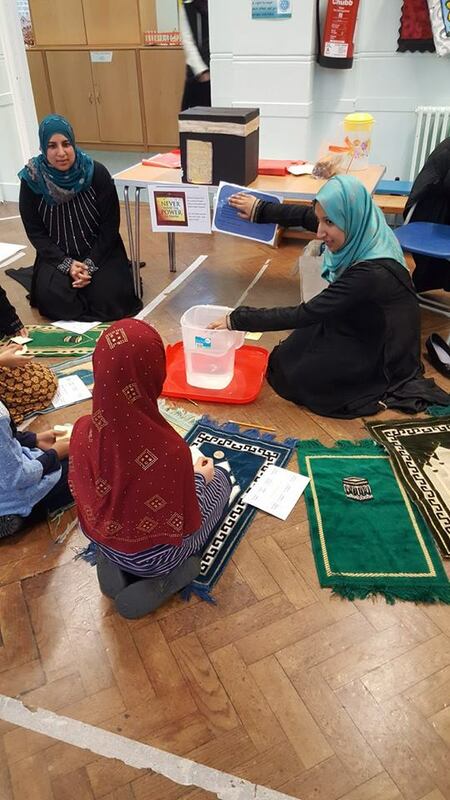 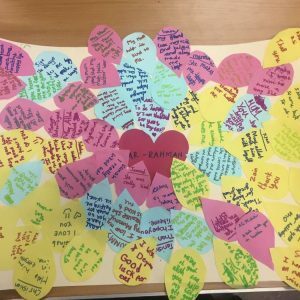 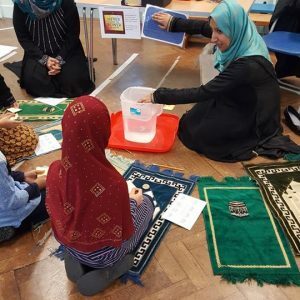 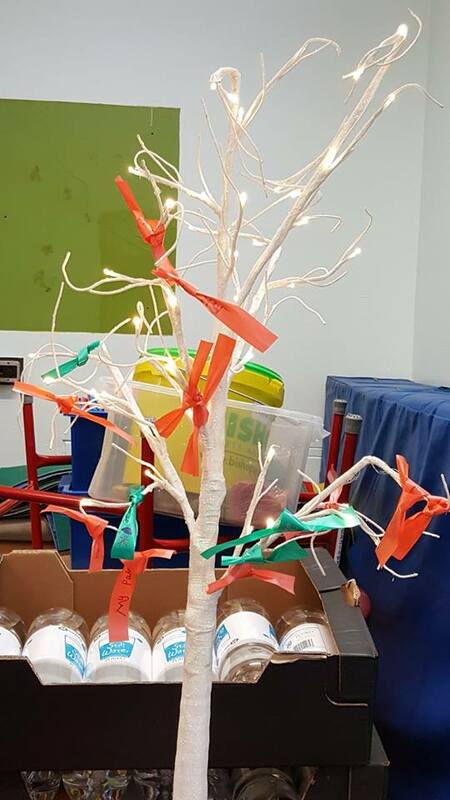 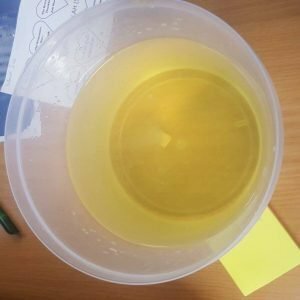 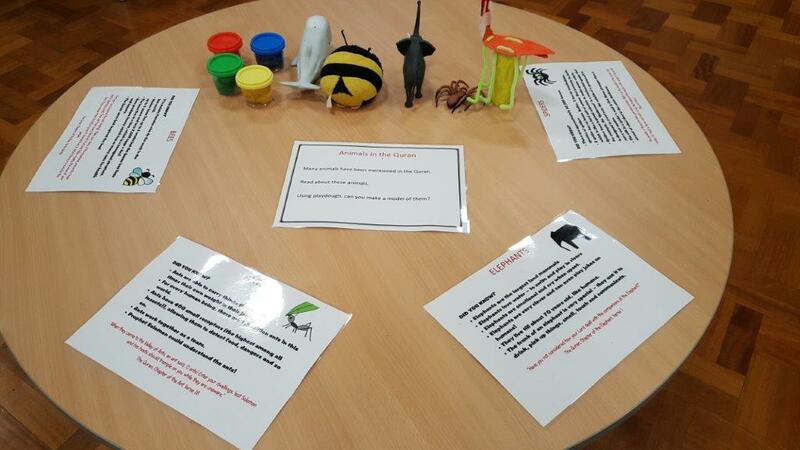 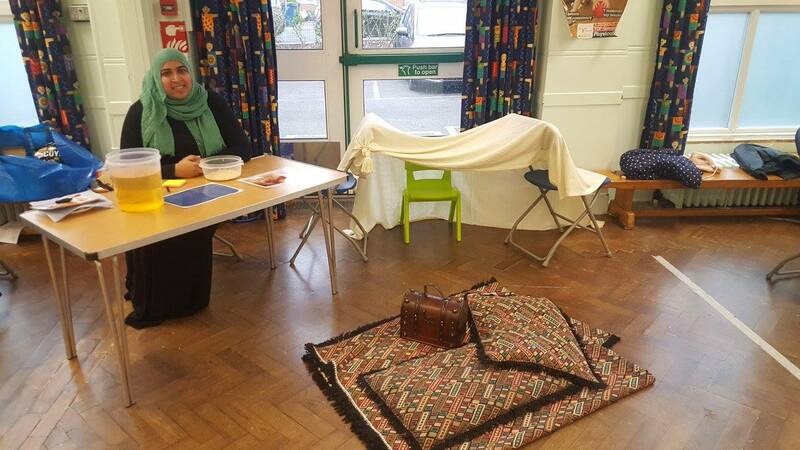 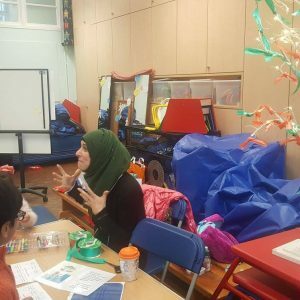 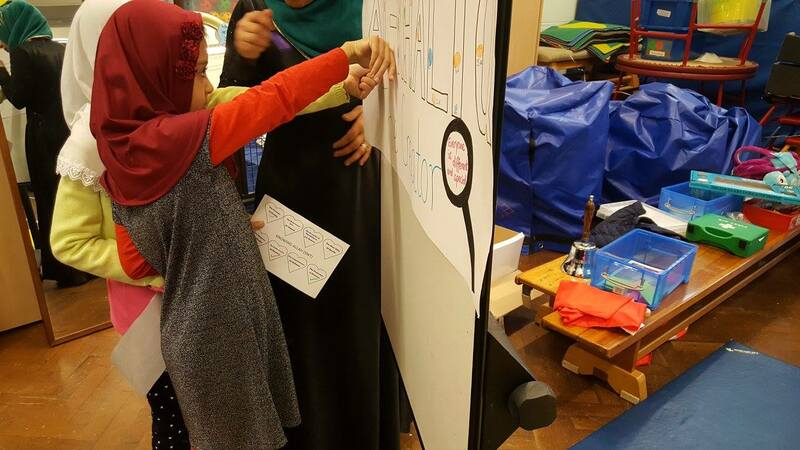 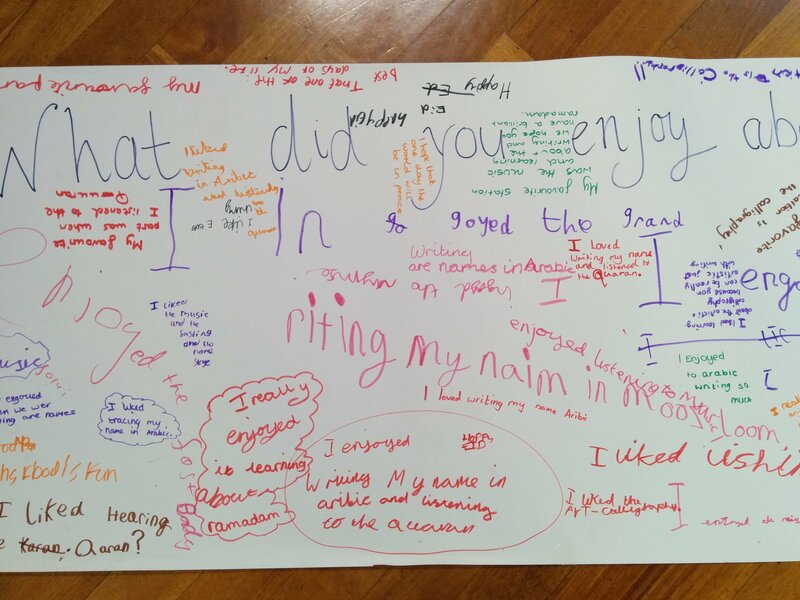 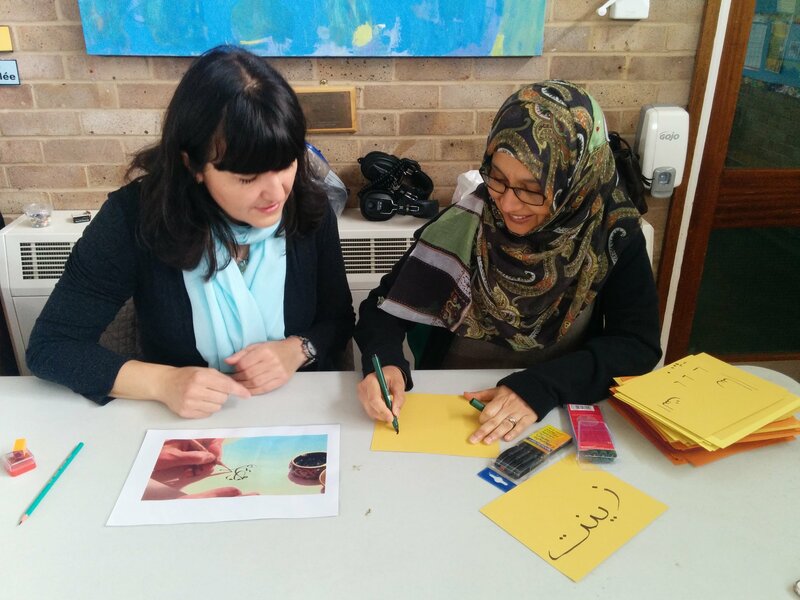 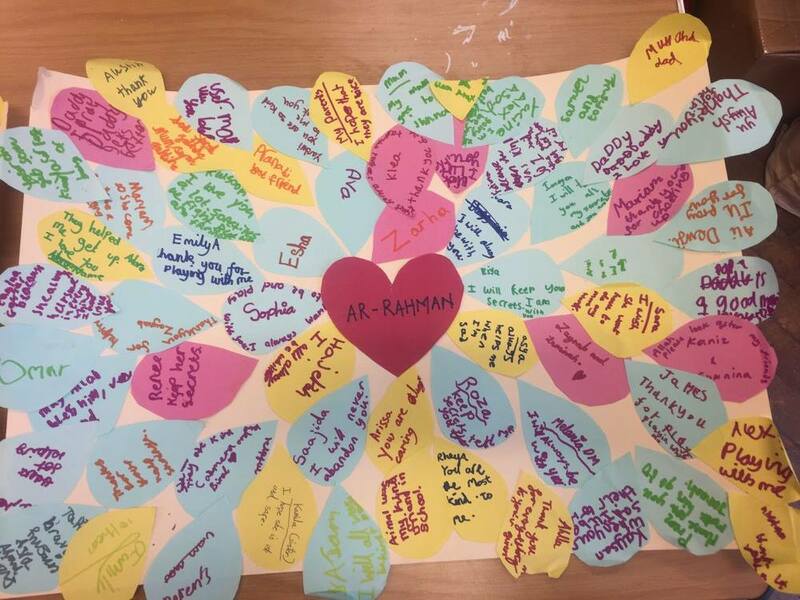 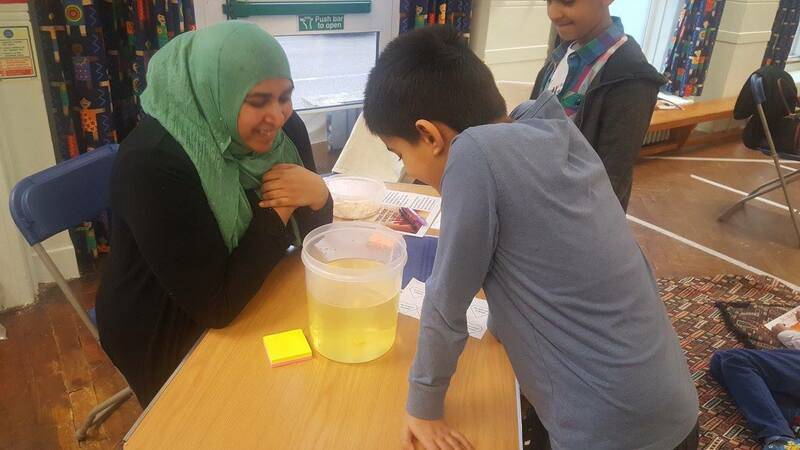 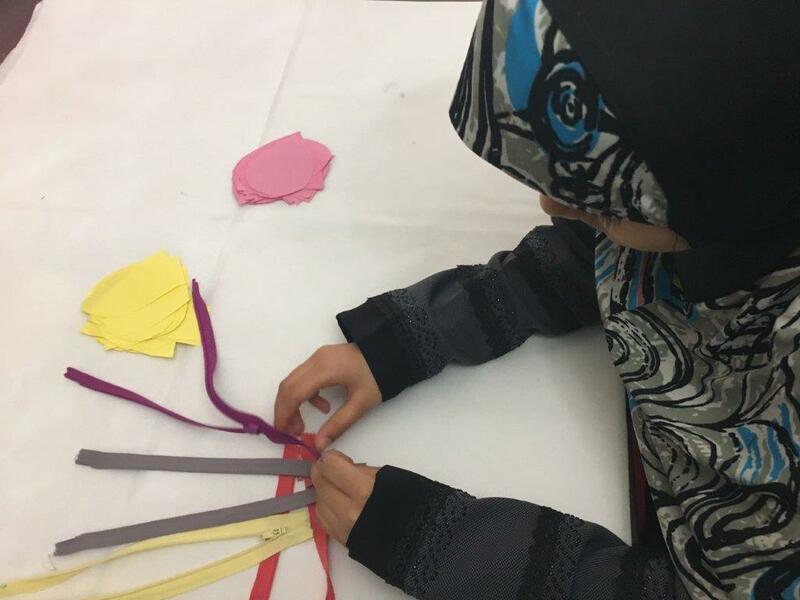 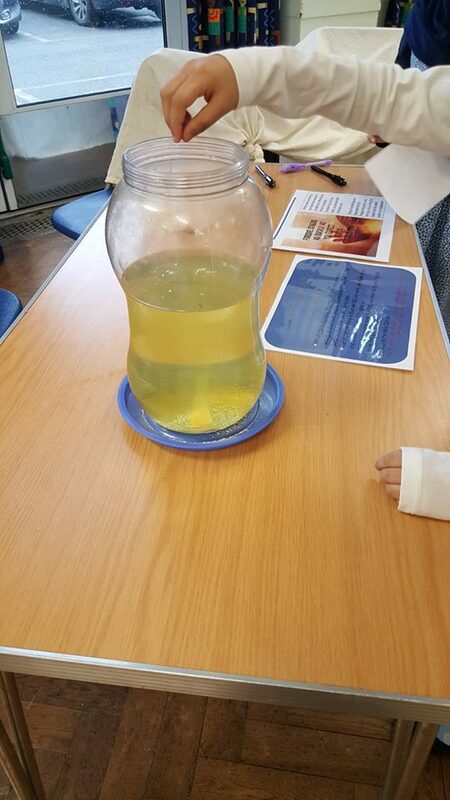 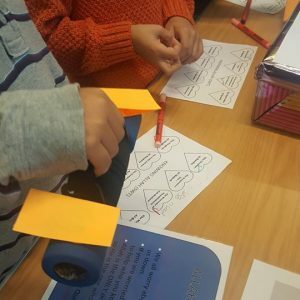 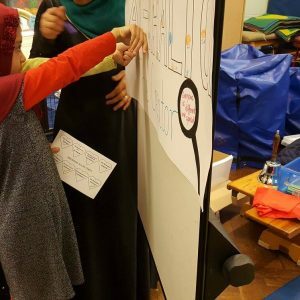 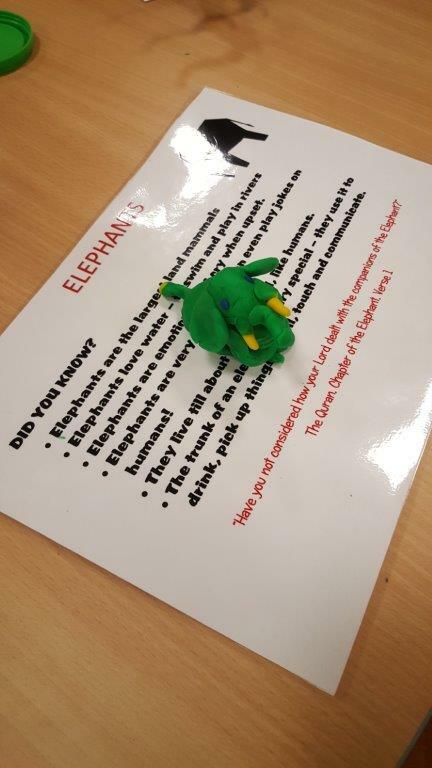 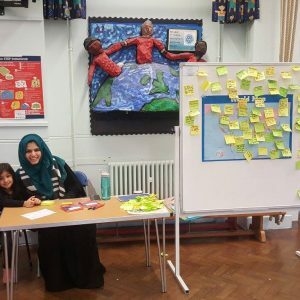 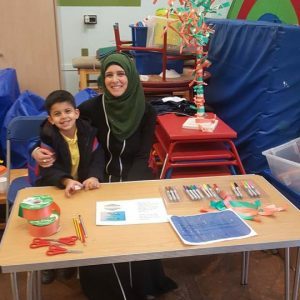 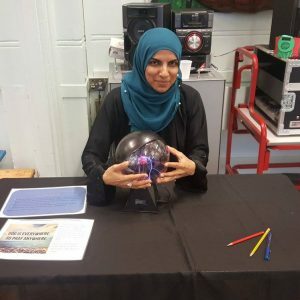 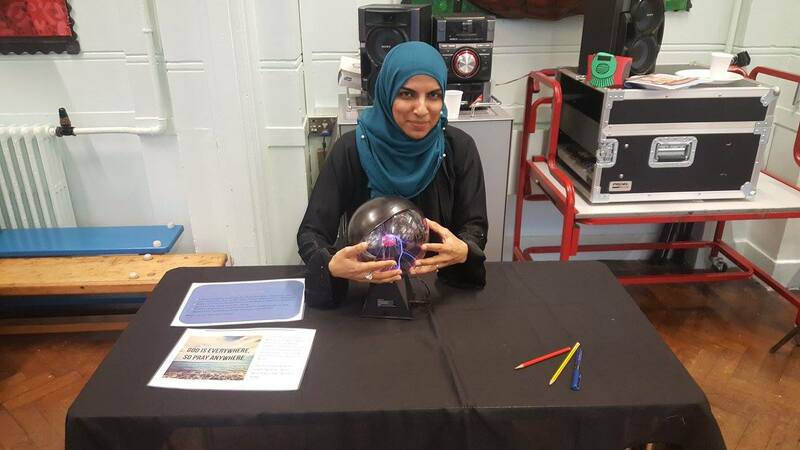 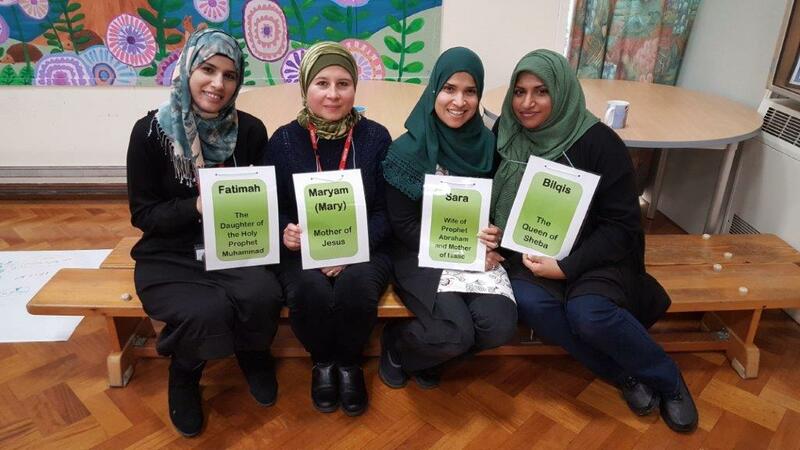 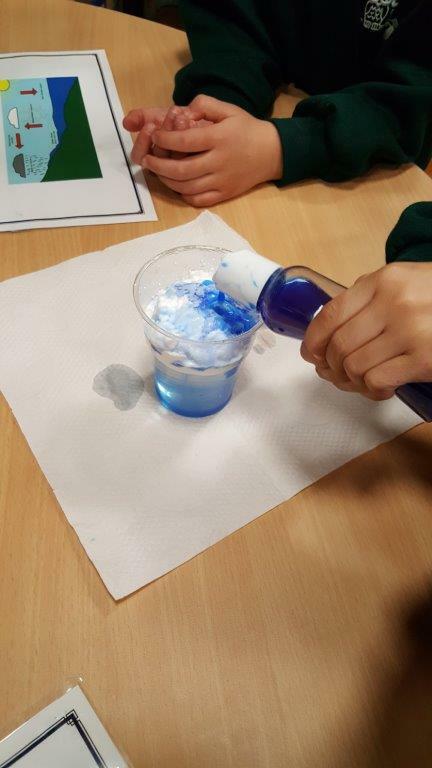 Alhamdulillah, the staff were really appreciative of this day – they felt like they learnt a lot too, and that the children could relate so well to all of the activities. 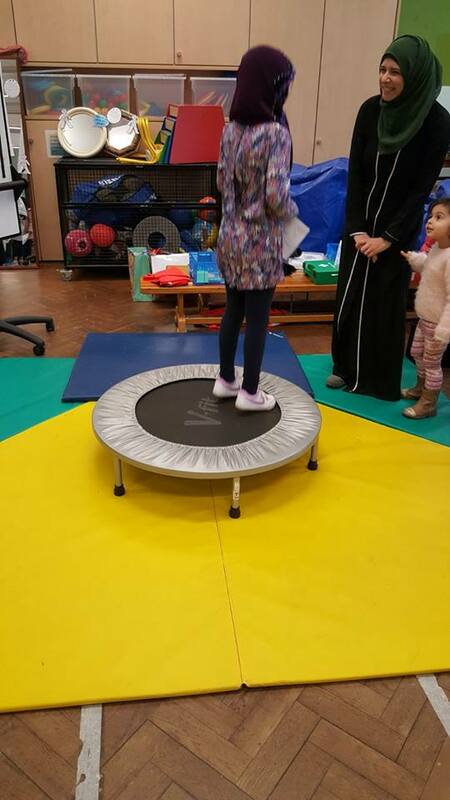 Parents were also invited in at one point to have a look which they enjoyed also. 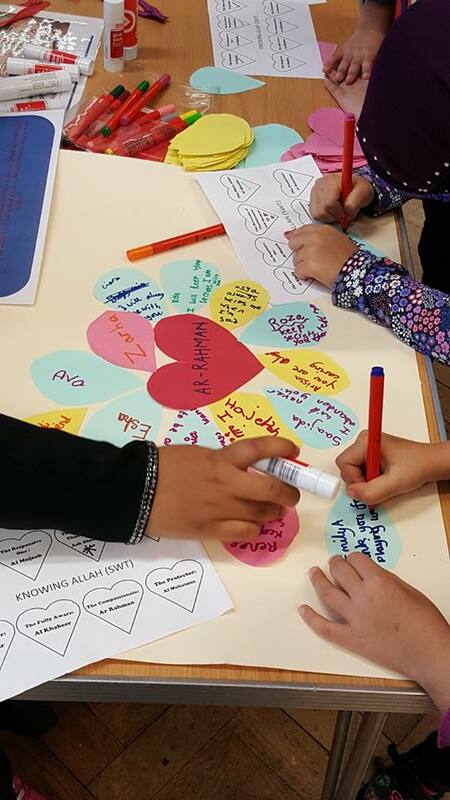 Inshallah with steps like these, we can try to prevent the prejudices that arise in society today due to lack of knowledge!